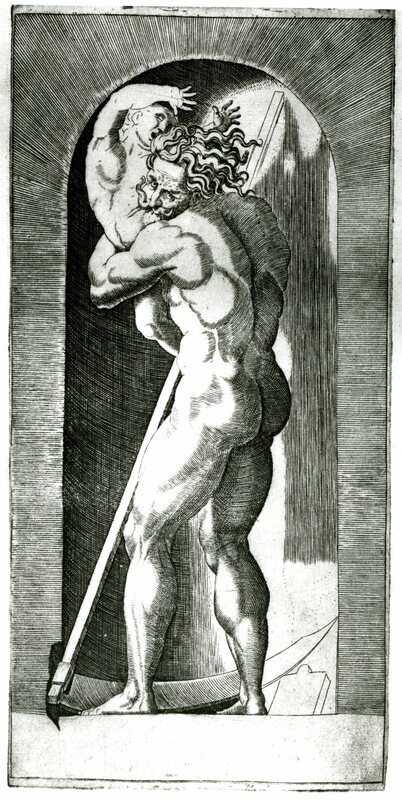 Twenty engravings by Gian Jacopo Caraglio. For States and copies, see below. Bartsch, XV, 1813, 77-79, 24-43. Le Blanc, 1854-1890, I, 589, 29-48. Herbet, III, 1899, 48 (1969, 136). In the following entries for the individual prints of this set, measurements are given from L when known, otherwise from S; in two cases the measurements of the niche are also given. Some are measured from late impressions probably made for Salamanca (on which, see below where these impressions are listed). Although as a set all twenty of these prints have approximately the same dimensions, they do vary. This would be due to the slightly different size of each engraving on the plate itself, but impressions of the same plate can also vary, the result, it would seem, of the shrinkage of the moistened paper drying under various conditions. A Latin inscription appears in the margin at the bottom of each print and is recorded below as accurately as possible. (A translation follows made by the late Vassar College professor James Day.) The Ns are backwards although they are transcribed normally here. The lettering is of clear Roman capitals but it is not the same size in all the prints of the series. In some impressions the lightly engraved guidelines above and below the lettering are visible. Each print is numbered, sixteen at the lower right, just above the level of the Latin inscription. Three, E.30, Neptune, E.40, Hercules, and E.44, Vulcan, are numbered at the lower left on the same level as the other numbers. E.35, Venus is numbered at the lower right below the level of the inscription. Under COLLECTIONS impressions are listed that would seem to be from the early printings, before the worn plates were acquired by Salamanca (see below). However, as his name appears only on the first of the series, Saturn, it cannot be determined for any of the others which were printed under him. Impressions from the worn plates were made before Salamanca acquired the plates (see the Saturn, London, VA, 27878.1). But it can generally be assumed that the prints that have lost the depth of many of their lines and therefore appear most “bleached” are from the Salamanca edition. The best impressions of this series are in the Uffizi but they are not all in excellent condition. The Uffizi has only a late impression of E.41, Hebe. The Albertina has a set in H.B.IV of varied impressions, some excellent, some very good or good, one or two pale, but all are trimmed; one is a copy by Bink (p.99, no. 109, Jupiter). The Albertina set in Vol. It.I.25 begins with the Saturn having the Salamanca address. These impressions are varied, but some are very good. They all have full P and L. I know of no other collection with a complete set. Good impressions of individual prints are rare. The impressions in the Uffizi are the finest I have seen. E.26. SATURN21.1 x 10.9 L (Oxford / Salamanca); niche 19 x 8.2 (Vienna). Inscribed on the tablet in the niche at the lower right: IACOBVS / CARALIVS / VERONEM / SIS • FECIT •_/_• / • 1526 • (Jacopo Caraglio of Verona made it, 1526); inscribed at the bottom: • DIVORVM • GENITOR • SVMMI • SATVRNVS •_OLYMPI • (Saturn, progenitor of the gods of highest Olympus); numbered 1.Fig.E.26 (Florence)Bartsch, XV, 1813, 77, 24.COLLECTIONS: Florence, 1092ss (cut around sides and top of niche and at both ends of the inscription; the lower right side is pasted on an impression of the Salamanca edition showing the end of Saturn’s scythe, the c. of the Salamanca address, and the number 1; laid down and a piece added across the top with printed line). London, VA, 27878.1 in Press I.2.C (worn plate but without Salamanca address). Vienna, H.B.IV, p.99, no. 107 (L cut from all sides, damaged right edge). E.27. OPIS21.4 x 10.8 L (London, 1853-7-9-93). Inscribed below: OPIS • SATVRNI • CONIVNX • MATERQUE_• DEORVM • (Opis, wife of Saturn and mother of the gods); numbered 2.Fig.E.27 (Florence)Bartsch, XV, 1813, 77, 25.COLLECTIONS: Florence, 1093ss (complete image including antlers at the left and shadows at the right that overlap L). Florence, Marucelliana, Vol. IX, 3 (slightly worn plate). London, 1853-7-9-93 (probably Salamanca). Vienna, H.B.IV, p.99, no. 108 (pale in animals at left). E.28. JUPITER21.1 x 11 L (Cambridge, Zerner / Salamanca). Inscribed: • IVPPITER •_AETHEREA • SVMMA •_DOMINATOR •_IN •_ARCE • (Jupiter, master in the high arch of the upper air); numbered 3.Fig.E.28a (Florence, photo cut at bottom)Fig.E.28b (Florence)Bartsch, XV, 1813, 78, 26. COLLECTIONS: Florence, 1094ss (bottom L slightly cut at right). Florence, Marucelliana, Vol. IX, no. 3 (pale and very spotted). E.29. JUNO21.3 x 10.9 L (Florence, 1115ss). Inscribed: • ET SOROR ET CONIVNX IOVIS EST SATVRNIA IVNO • (Saturn’s daughter, Juno, both sister and wife of Jove) ; numbered 4.Fig.E.29 (Florence, 1115ss)Bartsch, XV, 1813, 78, 27.COLLECTIONS: Bologna, C. 642 (452) (good and complete). Florence, 1095ss (upper left and lower right corners missing and filled, part of last word of inscription missing, L cut off at right, slightly stained); 1115ss. Florence, Marucelliana, Vol. X, no. 2 (pale and very spotted). Vienna, H.B.IV, p.99, no. 110. E.30. NEPTUNE21.2 x 10.7 L (Florence, 1116ss / Salamanca). Inscribed: • QVI MARIA IMPERIO REGIE NEPTVMNVS • ET • VNDAS • (Neptune, who rules seas and waves with imperial sway); numbered 5.Fig.E.30 (Florence, 1096ss)Bartsch, XV, 1813, 76, 28.COLLECTIONS: Florence, 1096ss (L cut from all sides); 1116ss. Florence, Marucelliana, Vol. IX, no. 5 (pale and foxed). Vienna, H.B.IV, p.99, no. 111. E.31. THETIS21.3 x 10.9 L (Florence, Marucelliana / Salamanca). Inscribed: • NEREIS • AEOVOREAS • INTER • CELEBERRIMA • MATRES •(Daughter of Nereus, most renowned among the mothers associated with the sea); numbered 6.Fig.E.31 (Florence)Bartsch, XV, 1813, 78, 29.COLLECTIONS: Florence, 1097ss (L cut from all sides, upper right corner missing and filled). Florence, Marucelliana, Vol. IX, no. 6 (pale and rubbed). Vienna, H.B.IV, p.99, no. 112. E.32. PLUTO21.3 x 10.8 L (Florence, 1118ss / Salamanca). Inscribed: • PLVTONEM • MAGNVM • MIRANTVR • QVAM • TARTARA • REGEM • (People stand in awe of great Pluto as much as they do of Tartarus over which he is king); numbered 7.Fig.E.32 (Paris)Bartsch, XV, 1813, 78, 30.COLLECTIONS: Bologna, C. 654 (454) (trimmed and damaged). Florence, 1098ss (L cut from sides and bottom and cut just above top L); 1118ss / Salamanca. London, Bink Vol., C46, p.9, 1853-7-9-102 (wrongly as Bink; cut and repaired, part of inscription missing, tip of left prong drawn in ink, squared in black lead). Paris, Eb 6b Rés. fol. Vienna, H.B.IV, p.100, no. 113. 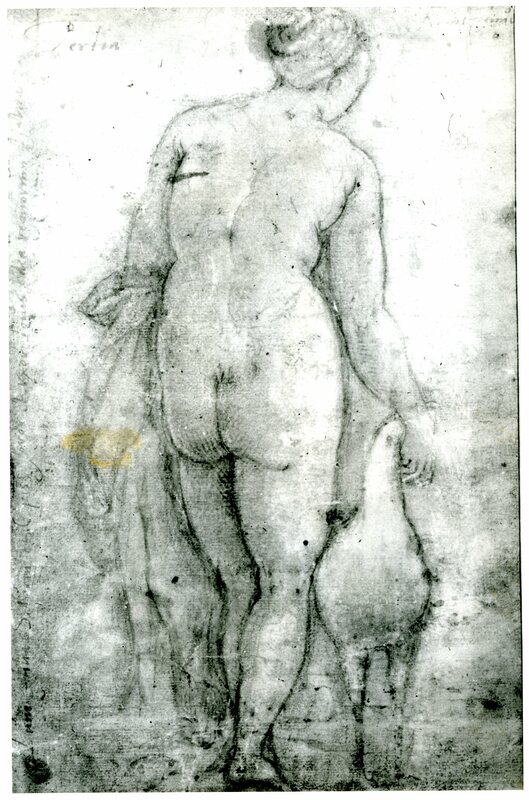 For Rosso’s drawing in Lyons for this print, see below and D.17 (Fig.D.17A). E.33. PROSERPINA21.3 x 10.7 S (Florence). Inscribed: • SVM DEA TARTAREI CONIVX PROSERPINA REGIS • (the second P in PROSERPINA corrected from an R) (I am Proserpina, wife of the king over Tartarus); numbered 8.Fig.E.33 (Florence)Bartsch, XV, 1813, 78, 31.COLLECTIONS: Florence, 1099ss (L cut from all sides). Florence, Marucelliana, Vol. IX, no. 7 (pale and rubbed at bottom). Vienna, H.B.IV, p.100, no. 114. 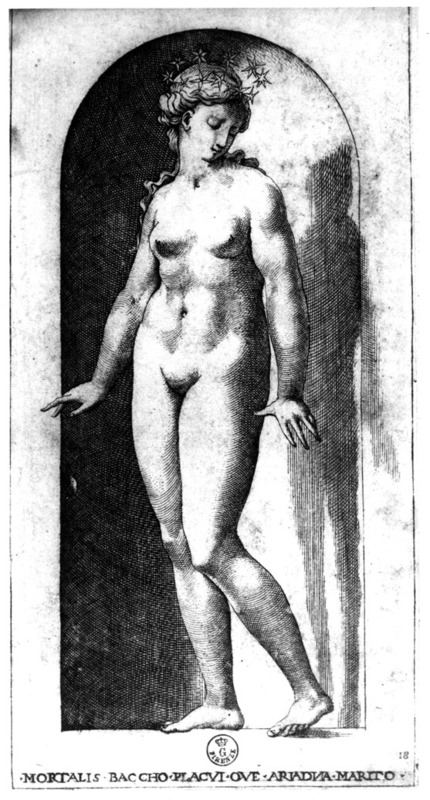 For Rosso’s drawing in Paris for this print, see below and D.17B (Fig.D.17B). E.34. MARS21.5 x 10.7 S (Florence). Inscribed: • MARS QVI VICTRICI COMITIT PROEDIA DESTRA • (Mars, who awards spoils of war with victor’s hand); numbered 9.Fig.E.34 (Florence)Bartsch, XV, 1813, 78, 32.COLLECTIONS: Florence, 1104ss (L partly cut on all sides; a line above O of COMITITadded in ink). Florence, Marucelliana, Vol. IX, no. 8 (foxed). Vienna, H.B.IV, p.100, no. 115. 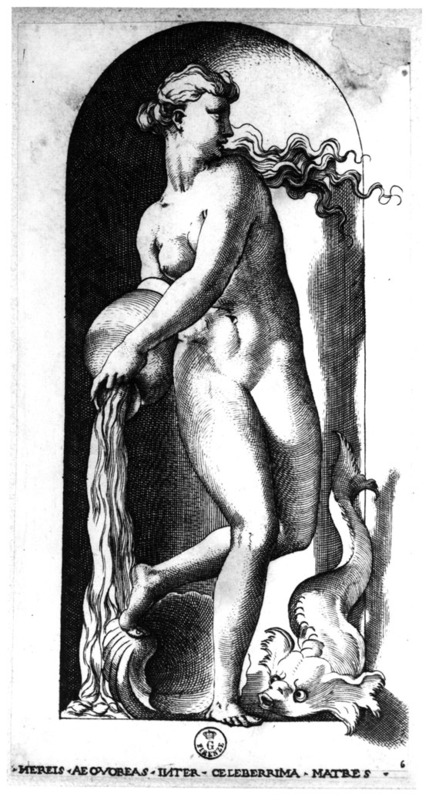 For Rosso’s drawing in Paris for this print, see below and D.17C (Fig.D.17C). E.35. 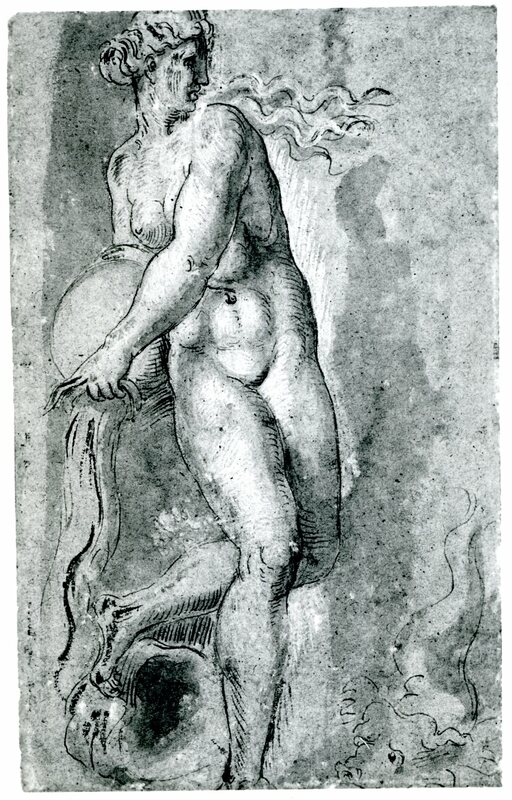 VENUS21.5 x 11 L (Florence, Marucelliana). Inscribed: • CIIPRIA LASCIVI PVLCHERRIMA MATER • AMORIS • (Cypria, most beauteous mother of wanton love); the number 10at the lower right slightly beneath the level of the Latin inscription.Fig.E.35 (Florence)Bartsch, XV, 1813, 78, 33.COLLECTIONS: Florence, 1105ss (L cut from all sides but partly visible at right and at bottom). Florence, Marucelliana, Vol. IX, no. 9. Oxford, Ashmolean (full L). Vienna, H.B.IV, p.100, no. 116. E.36. APOLLO21.5 x 11.1 L (Vienna / Salamanca). Inscribed at bottom across the radiating lines of light of the chariot’s wheels: • OMNIA • QVI • VIDEO • PER • QVEM • VIDET • OMNIA • TELLVS • (All things do I see and all the earth has sight through me); numbered 11.Fig.E.36 (Florence)Bartsch, XI, 1813, 78, 34.COLLECTIONS: Florence, 1101ss (L cut from all sides but partly visible at right, tips of three right fingers cut). Florence, Marucelliana, Vol. IX, no. 10 (pale and very foxed). Vienna, H.B.IV, p.100, no. 17. E.37. 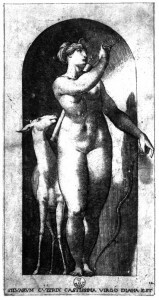 DIANA21.4 x 11 L (Florence, Marucelliana). Inscribed: SILVARVM CVLTRIX CASTISSIMA VIRGO DIANA EST (Diana is patroness of forests, a virgin most chaste); numbered 12.Fig.E.37 (Florence)Bartsch, XV, 1813, 78, 35.COLLECTIONS: Florence, 1102ss. Florence, Marucelliana, Vol. IX, no. 11. Vienna, H.B.IV, p.100, no. 118. E.38. MERCURY21.3 x 10.8 L (Florence, Marucelliana). Inscribed: • MERCVRIVS • DIVVM • QVI • FERT • RESPONSA • PER • AVRAS • (Mercury, who carries the gods’ messages through the air); numbered 13.Fig.E.38 (Florence)Bartsch, XV, 1813, 78, 36.COLLECTIONS: Berlin, 191-18. Florence, 1107ss (left L cut as well as the tip of the raised flute; period before inscription also cut). Florence, Marucelliana, Vol. IX, no. 12 (slightly pale). Vienna, H.B.IV, p.107, no. 119. E.39. CERES21.4 x 10.9 L (Florence, Marucelliana). Inscribed: • ALMA CERES DOCVIT SEGETVM SPEM CREDERE SVLCIS • (Fostering Ceres has taught us to place our hopes in the plowed field); numbered 14.Fig.E.39 (Florence)Bartsch, XV, 1813, 78, 37.COLLECTIONS: Florence, 1100ss (L mostly cut at left and right, stained across middle). Florence, Marucelliana, Vol. IX, no. 13 (slightly worn plate). Vienna, H.B.IV, p.101, no. 120. E.40. HERCULES21.3 x 10.8 L (Florence, 1126ss / Salamanca). Inscribed: HERCVLIS HEC FORMA EST GRAIIS CELEBRATA POETIS (This is the image of Hercules as widely proclaimed by Greek poets); numbered 15at lower left.Fig.E.40 (Florence)Bartsch, XV, 1813, 78, 38.COLLECTIONS: Florence, 1108ss (L at right cut). Florence, Marucelliana, Vol. IX, no. 14. Vienna, H.B.IV, p.101, no. 121. E.41. HEBE21.5 x 11 L (Florence, Marucelliana / Salamanca). Inscribed: • SVM • DEA • PERPETVA • GAVDENS •_FORMOSA • IVVENTA • (I am the beauteous goddess who glories in everlasting youth); numbered 16.Fig.E.41 (Vienna)Bartsch, XV, 1813, 79, 39.COLLECTIONS: Florence, Marucelliana, Vol. IX, no. 15 (fair but inscription badly rubbed). Vienna, H.B.IV, p.101, no. 122 (L at all sides cut as well as left heel of figure and the period before the inscription). E.42. BACCHUS21.5 x 10.9 L; niche 18.6 x 8.3 (Florence). Inscribed: • PAMPINEAS VLMIS DOCVIT QVI ADIVMGERE VITES • (He that has taught [us] to train the vine tendrils on elm trees); numbered 17.Fig.E.42 (Florence)Bartsch, XV, 1813, 79, 40.COLLECTIONS: Florence, 1110ss. Florence, Marucelliana, Vol. IX, no. 16 (worn plate). Vienna, H.B.IV, p.101, no. 123 (beginning of inscription missing). 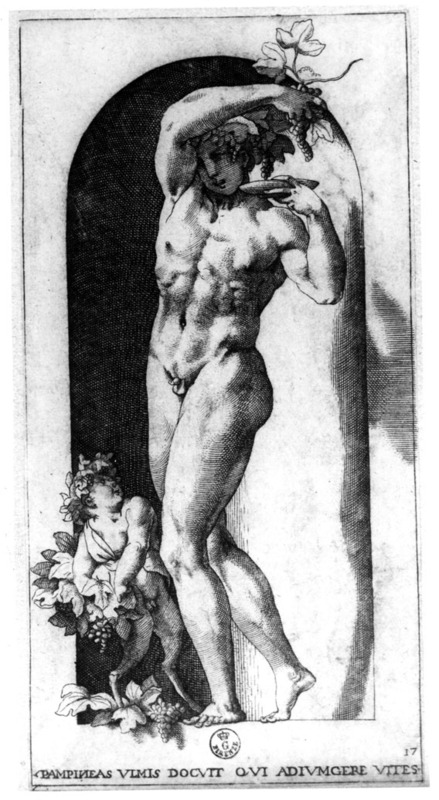 For Rosso’s drawing in Besançon for this print, see below and D.18 (Fig.D.18a). E.43. ARIADNE21.3 x 10.8 L (Florence, Marucelliana / Salamanca). Inscribed: • MORTALIS • BACCHO • PLACVI • QVE • ARIADNA • MARITO • (Ariadne, a mortal, who won the favor of Bacchus for husband); numbered 18.Fig.E.43 (Florence)Bartsch, XV, 1813, 79, 41.COLLECTIONS: Florence, 1111ss. Florence, Marucelliana, Vol. IX, no. 17 (good but pale). Vienna, H.B.IV, p.101, no. 124 (tip of lower left corner missing). E.44. VULCAN21.4 x 10.8 L (Florence, 1130ss / Salamanca). Inscribed: • AVREA • MI • CONIVNX • VENVS • EST • SATVRNIA • MATER • (Venus, Saturnian mother, is my golden spouse); numbered 19at lower left.Fig.E.44 (Florence, 1106ss)Bartsch, XV, 1813, 79, 42.COLLECTIONS: Florence, 1106ss (L at upper right and at bottom right cut); 1130ss / Salamanca. Vienna, H.B.IV, p.102, no. 125. E.45. MINERVA21.4 x 10.7 L; 21.6 x 11 P (Berlin). Inscribed: • INSIGNIS GALEA ATQZ INSIGNIS GORGONE PALAS • (the Z in ATQZ backwards) (Pallas, famous for helmet, famous for the Gorgon); numbered 20at lower right.Fig.E.45 (Florence)Bartsch, XV, 1813, 79, 43.COLLECTIONS: Berlin, 198-18 (torn in shadow at left). Florence, 1103ss (L cut from all sides but slightly visible at top; tip of Minerva’s raised hand and of the spear cut). Vienna, H.B.IV, p.142, no. 125. 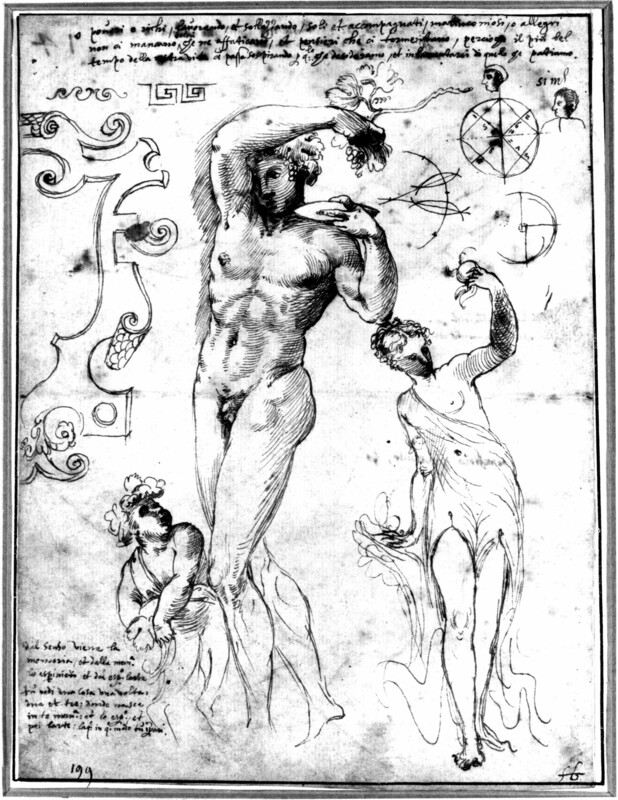 There are four known drawings by Rosso for this series, called disegni di stampe by Vasari, Pluto in Lyons (Fig.D.17A), Proserpina (Fig.D.17B) and Mars (Fig.D.17C) in Paris, and Bacchus in Besançon (Fig.D.18a). All are the same size as the engravings and show the figures in the same direction. All are executed in red chalk over varied outlines and some shading in black chalk, with reddish washes used for shading and shadows and for the entire surface of the walls surrounding the niches. The original line of the bottom of Pluto’s niche has been slightly lowered to accommodate the small lengthening of legs of Cerberus and the god. 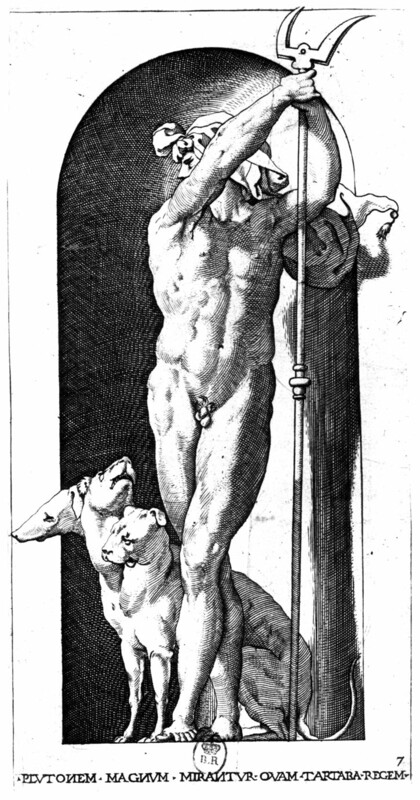 In the Bacchus, the hind quarters of a dog appear behind the god’s leg with only a few faint black chalk lines to suggest his body and one front leg, but no indications of a neck or head. Red washes of two shades fully define the hindquarters with a truncated tail while a thin long tail only outlined in black chalk extends over the wall outside the niche. Over the dog’s left hind leg falls the shadow of the diety. A critical glance at this dog by the artist, the engraver, or possibly Baviera, if not all three together, may have seen some degree of absurdity in this half-dog and it was eliminated. No other animal in the series, including Pluto’s Cerberus, is so ill conceived. 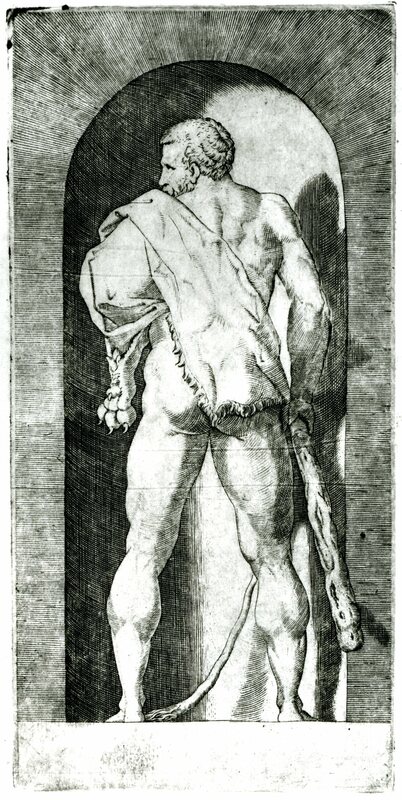 The line marking the upper edge of each (uncut) printed image is preserved in the Bacchus drawing, but is cut from the Pluto drawing. Here the left prong of Pluto’s fork is slightly longer than what appears in the engraving below its upper outline. In the print this prong overlaps the outline. What is clear from the relationship of the disegni di stampe and the engravings is the closeness with which Caraglio and Rosso worked together to produce the final prints, the major alteration of which is the elimination of the dark wall surrounding the niches. The removal of the dark outer walls allows for the greater effect of the depth of the niches, the volume of the figures, and the shadows that are outside the niches, and most important, of the appearance of the inscriptions below, which may not have been planned from the beginning. In many details the engraver has followed, insofar as possible, Rosso’s disegni di stampe almost line for line. Nevertheless beautiful as the drawings are, rare, fine, and thus early impressions of the engravings show them to be even more brilliant. Rosso must have overseen their production very carefully, but he also had an expert, remarkably sensitive, and sympathetic engraver in Caraglio to realize his conceptions. Mariette, Abécédario, 1858-1859, 19, as Caraglio after Rosso. 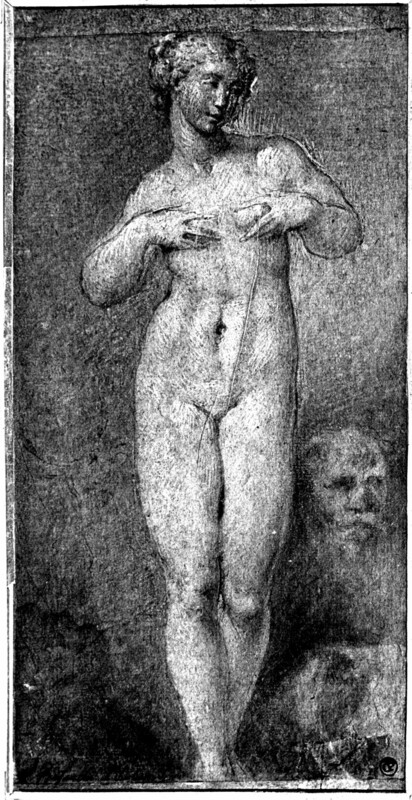 Goldschmidt, 1911, 22, as showing the influence of Raphael’s school. Antal, 1928-1929 (1966, 55, n. 3, 56, 64, ns. 1-2, 69). Kusenberg, 1931, 26-27, 162, Pls. XVII, 1-2 (Ceres, Apollo), and XVIII, 1-2 (Vulcan, Bacchus), are of the Villamena re-cut plates. De Witt, 1938, 52 (but Uffizi 1109, the Hebe, is of re-cut edition). Barocchi, 1950, 62-64, Fig. 40 (Ceres, with dark border). Carroll, 1961, 448, Fig. 6, Bacchus, 449. Petrucci, 1964, 44-45, 104, Pl. 39 (Opis with dark border). Carroll, 1964 (1976), I, Bk. I, 125-129, 140-142, Bk. II, 74, 81, 240-242, II, Bk. III, Figs. 43-55, 57-60, 62-64. Shearman, 1967, 67-68, 195, n. 33, Fig. 33 of the re-cut edition, with Marcantonio’s cipher added in pen. Thirion, 1971, 33, 35, Fig. 7, probably a copy after Bink, Fig. 8, Caraglio, 36, Fig. 12, Caraglio, Salamanca edition, slightly misprinted, Fig. 13, Caraglio, from very worn plate, Fig. 14, Caraglio, 37, Fig. 16, Caraglio, 38, Fig. 20, Caraglio, Fig. 21, Caraglio, Fig. 22, Caraglio, 39, Fig. 24 from very worn plate, 40, Fig. 27, Bink; all Paris. Campbell, in RISD, 1973, 74-75, nos. 78-79, ills. p.75, no. 78, Bink, no. 79, copy after Bink. Wallach, 1974-1975, 101-102, wrongly states that Caraglio’s prints were made from lost paintings by Rosso. Ferrara and Gaeta Bertelà, 1975, nos. 144, 146, with Figs. (Bologna, Juno, Pluto). Barolsky, 1978, 107, 109, Fig. 5-5 (Juno of Villamena edition with Marcantonio’s cipher added in ink), the “bird as phallus” seen in the peacock stroked by Juno. Carroll, 1978, 40, 42, 43, Fig. 29 (Opis, Florence, 1093ss). Smith, 1978, 112, Figs. 9-10, 113, relates the Thetis and Bacchus to two figures in Bronzino’s Martyrdom of St. Lawrence. Walters, 1978, 160, sees the great Olympians transformed into fashion plates. Borea, 1979, 368, Fig. 240 (Ceres, Florence). Borea, 1980, 230, 248, no. 618, 249, Figs. of Uffizi impressions of Saturn, Bacchus, Jupiter, Juno, and Apollo. Chastel, 1983, 160-161, 162, Fig. 81a (Apollo). Darragon, 1983, 12, 31, n. 23, 46, 64, cover Fig. (Mercury), Fig. 16, Mars (Villamena), Fig. 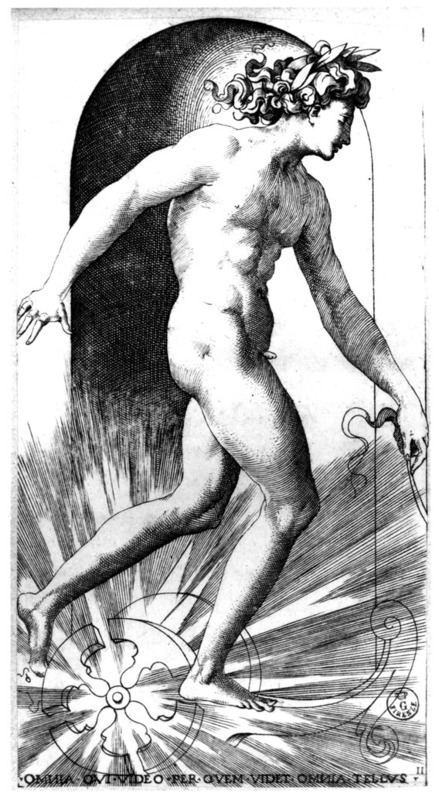 46, Juno (Paris); he suggests that Argus in the Mercury may have Rosso’s features. David Landau, review of The Illustrated Bartsch, BM, CCXV, March, 1983, 171, comments on the restored condition of the Pluto in London (1853-7-9-102) without, however, mentioning that it is an impression of Caraglio’s original print and not of Bink’s copy. Henriette Pommier, in Dessins … de Lyon, 1984, 26. Boorsch and Spike, IB, 28, 1985, 101-102, 105-120 (102, 104, Jupiter, Vienna, and 104, Juno, Berlin, are not impressions of Caraglio’s prints). Carroll, 1987, 9, 11, 24, 39, 52, 100-126, nos. 21-40, with Figs. (all Florence, except no. 36, Hebe, Vienna). 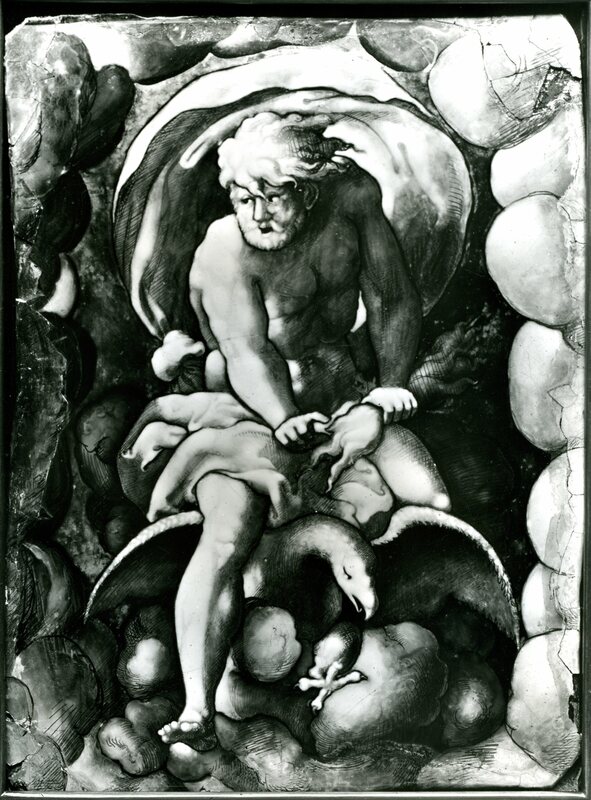 Davis, 1988, 201, the Bacchus and Jupiter mentioned in relation to Rosso’s Allegory on the Birth of Christ. Carroll, 1989, 9, 11-12, Figs. 4-14, 16 (all Florence). Massari, 1989, xviii, 117, 119-140, Nos. 36-55 I, Fig. 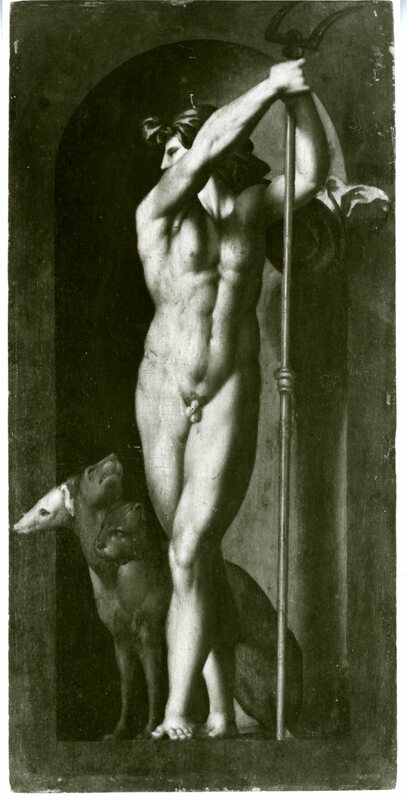 36a (Saturn, Uffizi); No. 51, Hebe, wrongly as State I.
Ciardi and Mugnaini, 1991, 15, 26, 31, as related to sculpture and to Parmigianino. Joukovsky, 1992, 81, n. 1, noted in relation to the figures in niches in the Gallery of Francis I and their connection with Roman imperial sculpture. 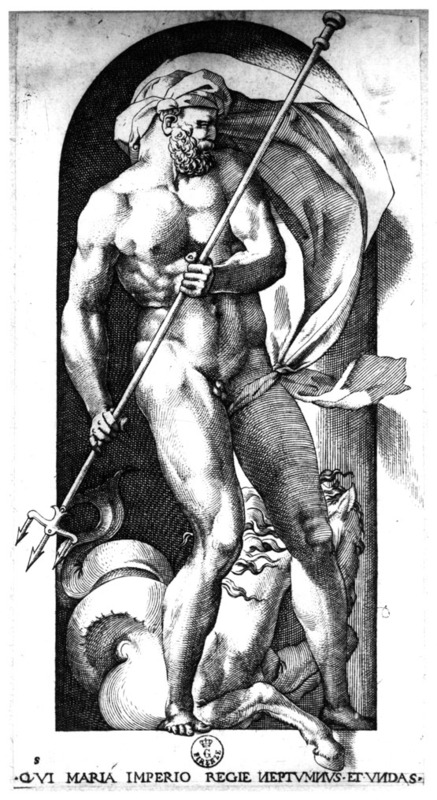 Vallone, 1993, mentioned the Jupiter in relation to a figure on a French key of 1548 in Warsaw. Landau, in Landau and Parshall, 1994, 159, 160, Fig. 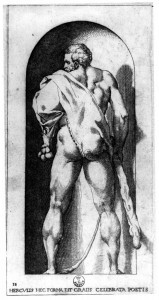 168 (Bacchus, Uffizi), a fine and concise account of the association of il Baviera, Caraglio, and Rosso, with the comment that Caraglio’s prints can better Rosso’s drawings that were made for them, as illustrated by the comparison between Rosso’s Pluto in a Niche in Lyons (D.17A) and Caraglio’s engraving (E.42) made from it. Franklin, 1994, 134-135, 138, 146, 150, 205, 316, Pls. 97 (Saturn, Florence, I), 100 (Pluto, Florence, I), 102 (Bacchus, London, III), 105 (Apollo, Vienna, III), 113 (Venus, Florence, III), 165 (Juno, London, III), noted their challenging variety, wit, and humor. Mugnaini, in Rosso e Volterra, 1994, 154-155, nos. 11-12, with Figs. (Jupiter and Hercules, both Rome, III). 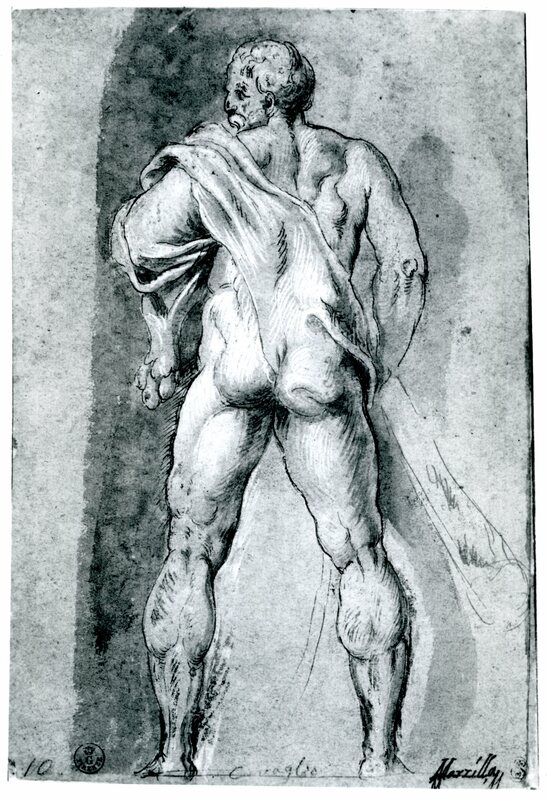 In his account of Caraglio’s career, Vasari mentions these prints after the Challenge of the Pierides (E.25), and as made from Rosso’s drawings commissioned by Baviera. In the “Life” of Rosso, they seem to be mentioned first of the two sets of engravings rather unclearly noted, again, as by Caraglio after Rosso’s drawings made for Baviera. 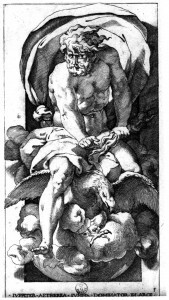 As the first of the series, the Saturn, is dated 1526, the date of these engravings is securely known. Rosso’s drawings were probably made the same year, although some could have been made during the latter part of 1525. They have always been recognized as by Caraglio after Rosso’s designs. However, the original impressions of these prints have rarely been reproduced. From the point of view of appreciating and understanding Rosso’s art, the Gods in Niches must be studied from excellent impressions made when the plates were not yet worn. Such impressions are very rare. However, for knowledge of the fame and influence of these images, the states and editions of the original plates and the copies of the prints need to be taken into account. Up to around 1600, three states or editions, including the first one, were published in Rome from the original plates, the last of these with the plates thoroughly and beautifully re-worked apparently by Francesco Villamena. These were printed again in Rome in 1771. In addition to the prints made from the original plates, there are several sets or partial sets of copies. At least a few of the Villamena edition were copied. 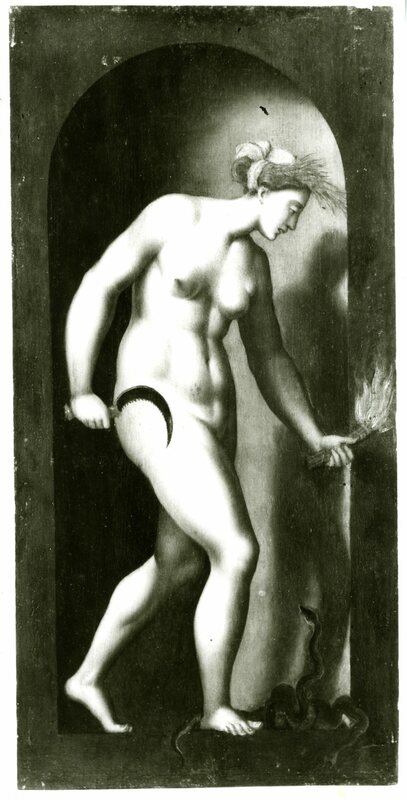 But already in 1530 the entire series was copied by the German engraver Jacob Bink, and these in turn were copied, carrying again Bink’s name and the date 1530. There is also a set of small copies of Bink’s engravings. Another small set by an anonymous engraver has the figures in reverse. Reversed also is a set in the original size of which only 17 are known. Du Cerceau made a set of copies in reverse and in the original dimensions. There are also other copies of individual prints that may indicate another set or sets or that may never have belonged to sets. Such prints as those by Solis and Losch listed below are derived from Rosso’s images but are not actually copies. 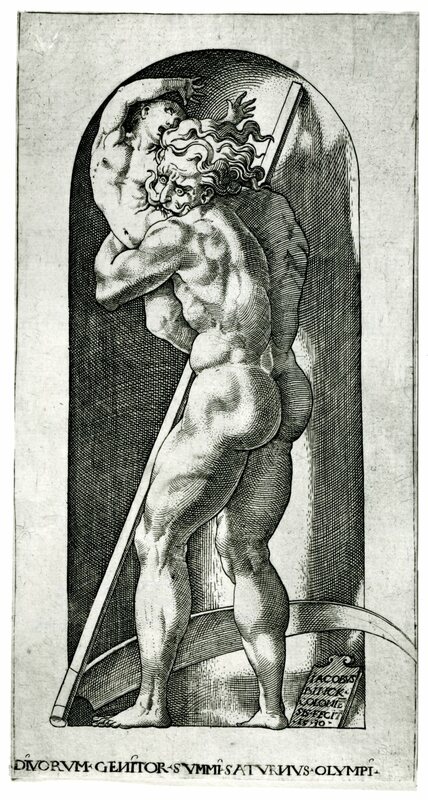 A most interesting anonymous set of 12 prints with variations was attributed by Bartsch to Marcantonio. Its special relationship to Rosso’s designs and to Caraglio’s prints is considered below. The following discussions of these states and copies give as much information as is now available. Although almost all of the prints have actually been seen and those that have not are known from reproductions, it has not been possible to have all of these many states and copies photographed. Hence it has not been possible always to check all observations against all the impressions that have been studied. There is still much work to be done on these prints. EDITIONS FROM THE ORIGINAL PLATES: State II. Salamanca edition. The first of the series, Saturn, has the additional inscription, at the lower right, just below the niche: Ant.sal.exc (Fig.E.26, II, Vienna), not mentioned by Bartsch. None of the other nineteen prints has this inscription. The prints are made from plates that have become very worn so that the shadows have become pale and the images look bleached (Fig.E.27, II, London). Some of the major lines appear very black, suggesting at first that these have been re-cut. But close inspection seems to indicate that these are the original most deeply cut lines, which now look darker because the finer lines have become so worn. Because only the first print of the series bears the address of Antonio Salamanca, it is not possible to tell with isolated weak impressions whether or not any belong to the Salamanca edition or were done before he had the plates printed but when they had already become worn. The paler the internal lines and hence the more “bleached” the appearance of the print, the more likely it is that it belongs to this edition. COLLECTIONS: Berlin, 196-18 (Ariadne). Bologna, C. 638 (449) (Saturn), C. 644 (455) (Mars), C. 645 (456) (Apollo), C. 628 (458) (Hebe), C. 629 (459) (Vulcan), C. 630 (460) (Athena, perhaps with some engraved lines in border at right). Cambridge, Mass., Henri Zerner Collection (Hebe). Florence, 1112ss – 1131ss (lacking Mercury, 2 impressions of Bacchus). Florence, Marucelliana, Vol. IX, no. 2 (Juno), no. 3 (Jupiter), no. 5 (Neptune), no. 6 (Thetis), no. 7 (Proserpina), no. 10 (Apollo), no. 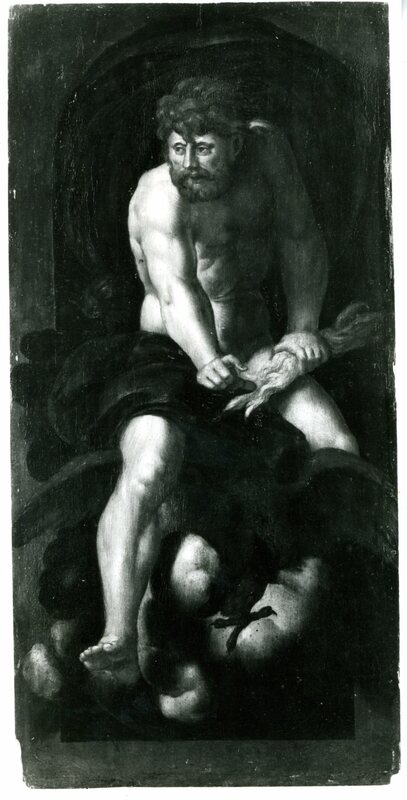 14 (Hercules), no. 15 (Hebe), no. 16 (Bacchus), no. 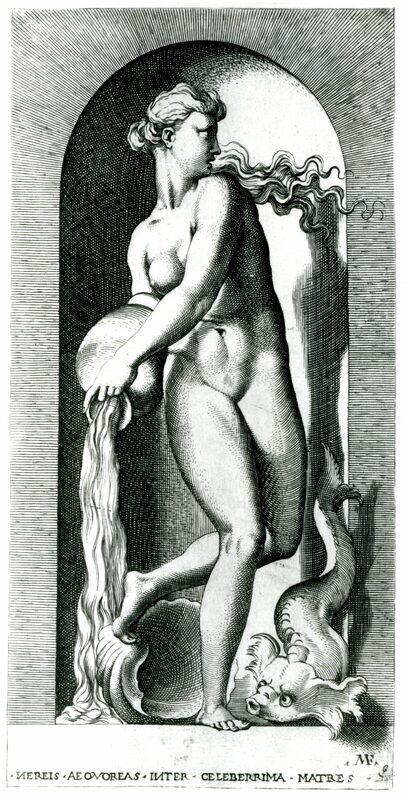 17 (Ariadne). London, Caraglio Vol. C53 (Pluto, 2 impressions, both with number 7 effaced), p.45, upper left (Ceres); Bink Vol. C46, p.8 upper right, 1853-7-9-93 (Opis; Fig.E.27, II, London), and lower right (Proserpina), see Koch, IB, 16, 180, pp.27, 33. London, VA, 27878.3 (Juno), 27878.10 (Apollo), in Press I.2.C. Oxford, Saturn, Venus, Mercury, Ceres, Bacchus, Ariadne, Vulcan, Minerva. Paris, Eb 6b Rés. (lacking Opis, Bacchus, Ariadne; Thirion, 1971, 35-39, Figs. 8, 12, 14, 16, 20-22, 24). Vienna, It.I.25, pp. 27-31, nos. 107-126 (all with full P; see Boorsch and Spike, I.B., 28, 1985, 107, 108, 112, 115). LITERATURE: De Witt, 1938, 52, lists the set in Florence. Ferrara and Gaeta Bertelà, 1975, nos. 141, 147-152, with Figs. (Bologna). Borea, 1980, 248, under no. 618. Carroll, 1987, 124, n. 1, under nos. 21-40. Massari, 1989, 122, No. 37, 123, No. 38, 124, No. 39, 126, No. 41, 127, No. 42, 128, No. 43, 129, No. 44, 130, No. 45, 131, No. 46, 132, No. 47, 133, No. 48, 134, No. 49, 135, No. 50, 136, No. 51, 137, No. 52, 138, No. 53 (all Florence, Marucelliana, IX, 2-17, and not including Saturn, Vulcan, and Minerva; also numbers somewhat different from those given above). State III, Villamena edition. The first of the series, Saturn, is inscribed at the lower right, just below the niche: Ant.sal.exc. (Fig.E.26, III, Vienna). None of the other nineteen prints has this inscription, which remains from the Salamanca edition. This set shows the plates completely re-worked in such a brilliant manner as to make of them almost new prints. But careful observation indicates that they are in fact the old plates brought newly to life. The variety and contrasts of lights and shades are greater than in State I. Most significantly, the wall around the outside of the niches at the top and sides, but not at the bottom, is shaded with closely spaced parallel lines, horizontal at the sides and radiating around the niche above; between the long lines of this shading are very short lines here and there that deepen the shading and create a somewhat agitated surface. 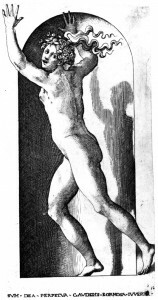 This shading partly returns to the prints the darkened outer walls of Rosso’s disegni di stampe in Besançon, Lyons, and Paris (Fig.D.17A; Fig.D.17B; Fig.D.17C; D.18a), but not that part below the niches. 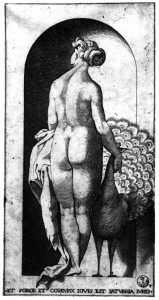 The engraver of the re-worked plates may, then, have known Rosso’s drawings. In comparison with the original prints, it becomes clear why Rosso and Caraglio abandoned this darkened outer surface, for it tends to decrease the importance and the chiaroscuro subtleties of the central figures and of the cavity of the niches. More importantly, lightening the background allowed for the inscriptions beneath the niches. In most respects the engraver otherwise carefully followed the designs that he found on the plates. But the following alterations can be seen. The Jupiter has been very much reworked, especially in the more detailed definition of hair, beard, feathers, and the fire of the god’s thunderbolt. There is only one land mass slightly visible on the globe of the earth. In the Hercules the engraver has added claws to the paw of the lion’s skin. Shading has been added to the small part that is visible of the bottom surface of the anvil in the Vulcan. 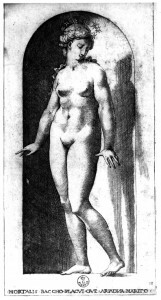 Bartsch, XV, 1813, 79, as Caraglio’s original plates re-worked by Francesco Villamena (on which, see below). Bartsch does not mention the Salamanca address. It is the prints of this set that are most frequently reproduced as Caraglio’s engravings: Kusenberg, 1931, Pl. XVII, 1-2, Pl. XVIII, 1-2; Barocchi, 1950, Fig. 40; Shearman, 1967, 67, Fig. 33; Birukova, in Actes, 1975, 52, Figs. 9-13. Borroni and Kozakiewicz, 1976, 616-617. Barolsky, 1978, 109, Fig. 5-5. The Juno reproduced by Shearman and Barolsky is in London and bears at the lower right the monogram of Marcantonio added in pen and ink. Mariette and Bartsch say that the engraver that re-worked Caraglio’s plates is Francesco Villamena, and this attribution has been generally accepted (Borea, 1980, 248, under no. 618, gives his first name as Antonio). It is a probable traditional attribution that the brilliance of the prints would support. Bartsch does not mention the Salamanca address that remains on the first print of this edition. Villamena was born in 1566. Salamanca died in 1562. If the prints are by Villamena, then the Salamanca address was maintained, it might be supposed, for its prestige. Massari, 1989, 119, gave the second engraver’s name as Antonio Villamena (c. 1564-1624), although he referred back to Bartsch who gave Francesco Villamena, but thought the attribution erroneous because the Salamanca address would indicate the retouching was earlier, ignoring, however, that Villamena got the plates after Salamanca had them. 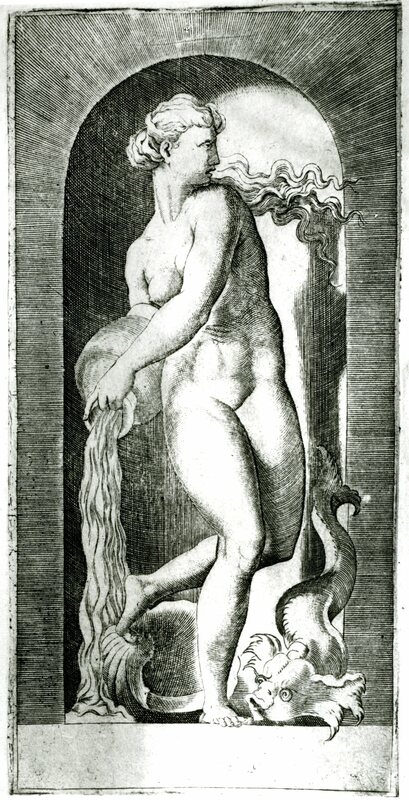 As by Francesco Villamena the earliest that the prints could date would be around 1590. The new style that the prints have been given suggests that they were done in the early seventeenth century. Francesco Villamena died in Rome on 7th July 1624. In the inventory of his possessions were plates engraved by other artists and subsequently reworked and restored by him, including “Vinti pezzi de stampe dalli Dei disegnate dalle statue antiche” which may have been Caraglio’s Gods in Niches (see Trinchieri Camiz, 1994, 510, 516, Document C, no. 34, where Trinchieri Camiz recognized them as Caraglio’s prints of 1526, but then inadvertently as after Giulio Romano). COLLECTIONS: Bologna, C. 639 (450) (Saturn). Berlin, 176-18 (Saturn). Boston (Jupiter). Cambridge, Mass., Harvard University Art Museums, Fogg Museum, R675 (Jupiter). Florence, 1109ss (Hebe). London, Caraglio Vol., C53, p.38 (Saturn, Jupiter), p.39 (Pluto), p.40 (Mars, Apollo), p.41 (Mercury, Hebe), p.42 (Minerva, Ariadne, Vulcan, Bacchus), p.43 (Juno, Neptune, Thetis), p.44 (Pluto, Proserpina, Venus), p.45 (Ceres, Hebe, Bacchus), several , including Thetis, with Marcantonio’s monogram added in ink (Fig.E.31, III, London). London, VA, Press I.2.C., 27878.5 (Neptune), 27878.7 (Proserpina), 27878.12 (Apollo), 27878.14 (Hebe), 27878.15 (Bacchus), 27878.15 (Minerva). New York, 49.97.222-241. New York, Public, MEZDP (Mercury). Paris, Eb 6b Rés. 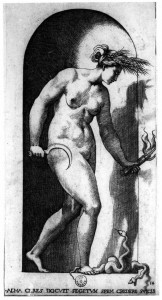 (Venus, Hebe). Rome, Fondo Corsini, Vol. 26 M 30, nos. 05895-05919, and Fondo Nazionale, F. Pio Vol. V, 1221-1240 (34935-34954). Vienna, It.I.25, pp. 32-36, no. 1-20. LITERATURE: Mariette, Abécédario, 1858-1859, as retouched by Francesco Villamena. Kusenberg, 1931, 157, as retouched by Francesco Villamena. Ferrara and Gaeta Bertelà, 1975, no. 142, with Fig. (Bologna, Saturn). Boorsch and Spike, I.B., 28, 1985, 121-140 (Berlin and Vienna). Carroll, 1987, 124, n. 1, under nos. 21-40. K. Orchard in Zauber der Medusa, 1987, 264, V, 58, Fig. (Vienna, H.B.IV, p.49/68), Minerva, as by Bink, but actually of the Villamena set (in Albertina Volume, not HB). Massari, 1989, 119-140, Nos. 36-55, II, all illustrated (Rome, Fondo Corsini). State IV, Losi edition. The first print of this set, Saturn (Fig.E.26, IV, Vienna), is inscribed in the margin below, just beneath the lower edge of the niche and above the Latin inscription: In Roma 1771 • a Spese di Carlo Losi •; the number 1 at the lower right just beyond the Latin inscription. COLLECTIONS: Paris, Sa 1 (Saturn). Vienna, It.II.21, pp. 79-83, 4 prints to a page. LITERATURE: Carroll, 1987, 124, n. 1, under nos. 21-40. This series is a reprinting of the Villamena edition with the Salamanca address removed and very slight re-cutting here and there (see in front of the toes of Saturn’s right foot). As only the first of the series has the Losi inscription, it may not be possible to tell from isolated impressions of the other prints that they are from this edition rather than from the Villamena edition. Massari, 1989, 13, n. 1, 119, hypothesized a state with the Losi address because the prints are listed in his inventory of 1788 (Indice delle Stampe intagliate in rame, a bulino e in acqua Forte, printed in Rome with “licenza de’superiori” as “Deità in numero di venti, ciascuna delle quali è posta in una nicchia, intaglio a bulino di Giacomo Caraglio veronese in 20 quarti di foglio reale”). COPIES, PRINTS: E.115, 1 – 8 or 9. Anonymous. Engraved copies of prints of the Villamena edition, with dark borders, in the same direction, and the same size. Possibly an incomplete set of which 8 are known: Opis, Juno, Neptune, Pluto, Ceres, Diana, Vulcan, and Minerva. A ninth may be Jupiter in Bologna (19.5 x 10.9, with bottom margin cut off); 20.3 x 10.4 P, including margin below of 0.7 (Neptune); 20.8 x 10.8 P, including margin below of 1.1 (Pluto). No inscriptions; the Minerva (known only from a reproduction) is apparently numbered 20 at the lower right in the margin. The plates of the Neptune and Pluto still exist (see below). COLLECTIONS: Bologna, C. 641 (451) (Jupiter). Cambridge, Fitzwilliam, P.110-1952 (Opis), P.111-1952 (Juno), P.112-1952 (Diana). Rome, Vo1.26 M 30, no. 05911 (Ceres, 21.6 x 10.9 S, including lower margin of 1.9), no. 013716 (Vulcan). Unknown locations, Krönig, 1974, 139, Fig. 23 (Minerva); Poirer, 1964, Hor texte planche XXXIII (Neptune and Pluto, actual impressions). LITERATURE: Ferrara and Gaeta Bertelà, 1975, no. 143, with Fig. (Bologna, Jupiter). Carroll, 1987, 125, n. 27, under nos. 21-40. These prints are excellent copies of the prints of the Villamena edition. Only some of the differences between them are known. In the Neptune, the shaded wall area at the right is slightly narrower and the unshaded margin below is less high, with the bottom of the plate cutting off the hoof of the sea horse. The margin below is also not as high in the Pluto, where the line at the top crosses the left prong of the god’s fork slightly higher up; there are no short lines in the shading around the niche. In the Minerva, the upper line is above the finger of the goddess and the head of the Medusa may have no teeth. E.6, 1 – 20. Jacob Bink. Twenty engravings after Caraglio’s original prints, with white borders, in the same direction, and the same size. 21 x 10.6 L (Juno, Vienna). Inscribed on the first of the series, Saturn, on a plaque in the niche at the lower right: ÎACOBVS / BINCK • COLONIE / SIS • FECIT / •_15 • 30 • (Fig.E.6, 1, Vienna). In the inscriptions beneath the niches, compared to Caraglio’s prints, the use or absence of dots between the words is not always the same. In Bink’s prints the Ns are backwards, as in Caraglio’s prints, except in the Hebe, Bacchus, Vulcan, and Minerva where the diagonals of the Ns are doubled, one crossing in each direction (except the second N in INSIGNIS of the Minerva, which is merely backwards). The last S in the inscription of the Proserpina is backwards. Many of the Is in Bink’s prints have a small arc above (not found in Caraglio’s prints). The following changes of words or spelling are also found: Thetis, NEPEIS instead of NEREIS, the I missing from CELEBERRMA, MATEES instead of MATRES; Mars, PROEBIA instead of PROEDIA; Apollo, OMNIA added at the beginning of the inscription; Diana, CVITRIX instead of CVLTRIX; Ceres, AEMA instead of ALMA; Hercules, EORMA instead of FORMA; Hebe, EORMOSA instead of FORMOSA; Bacchus, VIMIS instead of VLMIS; Minerva, ATOS and GORGON instead of ATQZ and GORGONE. 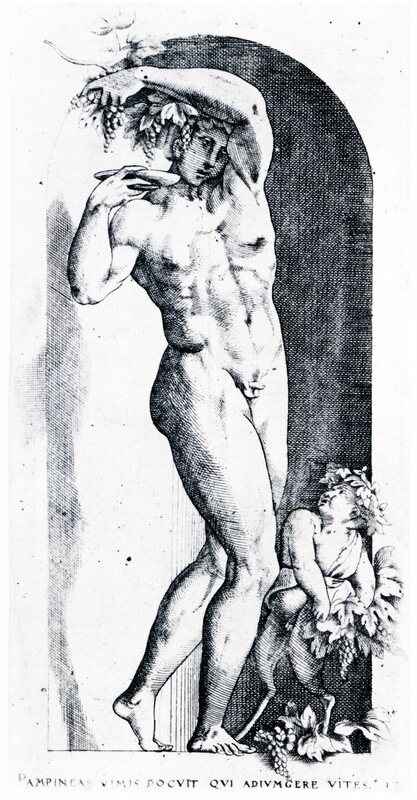 Bartsch, VIII, 1808, 272-274, 26-45; also mentioned under Caraglio’s original prints, Bartsch, XV, 1813, 79. COLLECTIONS: Berlin, Opis, Jupiter, Juno, Apollo (see Boorsch and Spike below). 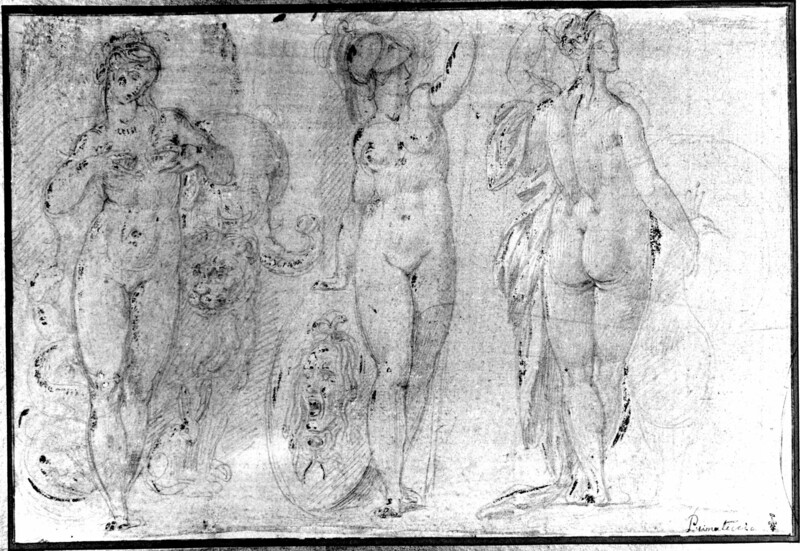 London, Bink Vol., C46, p.8 upper left (Saturn), p.9 upper left (Neptune), p.10 lower right (Diana), p.11 upper left and right (Ceres, two impressions), p.12 upper left (Bacchus), upper right (Ariadne), lower left and middle left (Vulcan, two impressions), lower right (Minerva). London, VA, Press I.2.C, 27878.2 (Opis), 27878.3 (Jupiter), 28880 (Thetis), 27867 (Neptune), 28410.2 (Opis). Vienna, H.B.XLVIII, 5, p.26, nos. 1 (Fig.E.6, 1, Vienna), 2, 3, p.29, nos. 15, 16, p.30, nos. 17, 18, 19, 20; Vol. H. B. XLIX, 2, p.96, no. 4, p.97, nos. 5, 6, 7, 8, p.98, nos. 9, 10, 11, 12 (numbers are of prints in series; missing 13, Mercury, and 14, Ceres). LITERATURE: Heinecken, II, 1788, 711, as Bink after Caraglio. Renouvier, 1854, 82. Le Blanc, 1854-1890, I, 342, 28-47, and 589, under 29-48. Mariette, Abécédario, 1858-1859, 19, as Bink. Antal, 1928-1929 (1966, 91, n. 2). Kusenberg, 1931, 159. Hollstein, G. IV, 1957, 47, 75-94, Figs. (Neptune, Mercury, Minerva). Thirion, 1971, 33. Borroni and Kozakiewicz, 1976, 617. Borea, 1980, 248, under no. 618. Koch, I.B., 16, 1980, 26, 30-31, 36-37, 39-45 (the other illustrations are not of Bink’s engravings). Henriette Pommier, in Dessins…. de Lyon, 1984, 26. Boorsch and Spike, I.B., 28, 1985, 141-160 (Berlin and Vienna). Carroll, 1987, 125, n. 27, under nos. 21-40. Massari, 1989, 120. Bink’s prints are very close copies of Caraglio’s engravings, but with a certain regularity of execution in places and also a certain coarseness that distinguishes them from the originals. Bink’s Jupiter does not have a landmass at the lower right of the globe of the earth. The crest of the peacock in the Juno is rather unclear. In the Apollo, the meeting of the rays of light against the dark background of the niche is somewhat unsuccessful. There is no shadow under the goddess’s left hand in the Diana. There are copies of Bink’s prints that are sometimes identified as Bink’s, although they actually look quite different. E.116, 1 – 20. Anonymous. Twenty engravings after Jacob Bink’s copies (E.6, 1 – 20) of Caraglio’s prints, with white borders, in the same direction, and the same size. 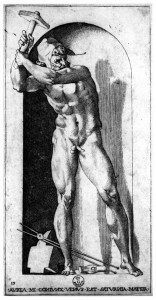 20.9 x 10.6 L, the niche 18.5 x 7.9, Saturn, Vienna (Fig.E.116, 1, Vienna). Inscribed on the first of the series, Saturn, on a plaque in the niche at the lower right: IACOBUS / BINCK • / COLONIE / SIS • FECIT / • 1530 •. In the inscriptions beneath the niches, the use of dots between the words is as in Bink’s prints except in the Hebe where there are none (but 7 in Bink) and in the Ariadne where there are also none (but 1 in Bink). All the Ns are in the right direction except the two in CONIVNX of the Vulcan, which are backwards. None of the Is are superscripted. The following differences of words and spelling from what appears in Bink’s prints are: Jupiter, only one P in IVPITER; Neptune, REGIAE instead of REGIE; Thetis, only one R in CELEBERIMA and MATRES instead of MATEES; Pluto, QVAM missing (because the line would have been too long with the necessary lettering and spacing); Proserpina, the S of REGIS not backwards; Mars, COMMITTIT PRELIA DEXTRA instead of COMITIT PROEBIA DESTRA; Venus, only one R in PVLCHERIMA; Diana, CVLTRIX instead of CVITRIX; Ceres, ALMA instead of AEMA; Hebe, P is missing from PE[C]IETVA; Minerva, ATQVE, GORGONE, and PALLAS instead of ATOS, GORGON, and PALAS. COLLECTIONS: Berlin, 177-18 (Jupiter). London, Caraglio vol., C53, several prints including p.43, upper left, 1853-7-9-110, Diana (Fig.E.116, 12). Lyons, exhibited (private coll., Dunand, 1973, no. 2, Fig.). Paris, Ba. 12, pp. 18-21 (full set). Vienna, H.B.IV, p.99, no. 109 (Jupiter); H.B.XLIX, 2, pp. 100-104 (full set). LITERATURE: Koch, IB, 16, 1980, 28, 35, 38 (Jupiter, Venus, Mercury) wrongly as Bink. Carroll, 1987, 41, 125, n. 27, under nos. 21-40. These prints, which have never been catalogued and which in Paris and Vienna are noted as by Bink, are very regularized copies of Bink’s engravings. It might, of course, be argued that the relationship of these prints is the very opposite, but it seems more likely that these very academic prints, recognizable as such both in the images and the inscriptions, are copies made later in the century, and perhaps at the very end of it, from Bink’s engravings of 1530, rather than that the accurate but less slick copies were made from the others. In the Ceres, the shadow cast by the goddess has the appearance of a devil in Caraglio’s original print. Something of this Satanic profile remains in the print given to Bink. But in the other copy this allusion has quite disappeared, suggesting that it is the third version. 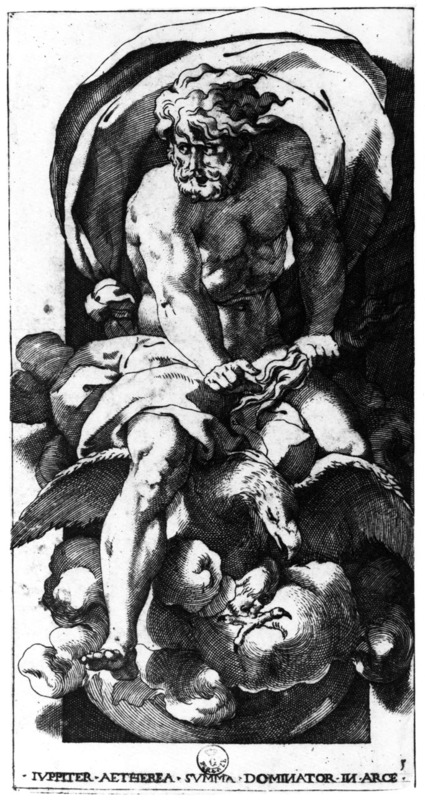 At least half the prints have details that show their derivation from Bink’s engravings rather than from Caraglio’s: Saturn, large white irises; Opis, large lips; Jupiter, no landmass at the lower right of the globe of the earth; Juno, the crest of the peacock; Apollo, the rays of light against the darkness of the niche; Diana, no shadow under the goddess’s left hand; Mercury, the physiognomy of the face; Bacchus, satyr’s white lips, and the dots around the shadow cast on the wall outside the niche; Minerva, the grooves at the bottom of the goddess’s lance. The other prints of the set could just as well have been copied from Caraglio’s original prints, so accurate are Bink’s own copies. But as the second set of copies was made in Northern Europe, it is likely that the copyist worked from a full set of Bink’s copies. The fine lettering and spacing of the inscriptions differ significantly from what appears in Bink’s copies, but they are also unlike what is found in Caraglio’s engravings. 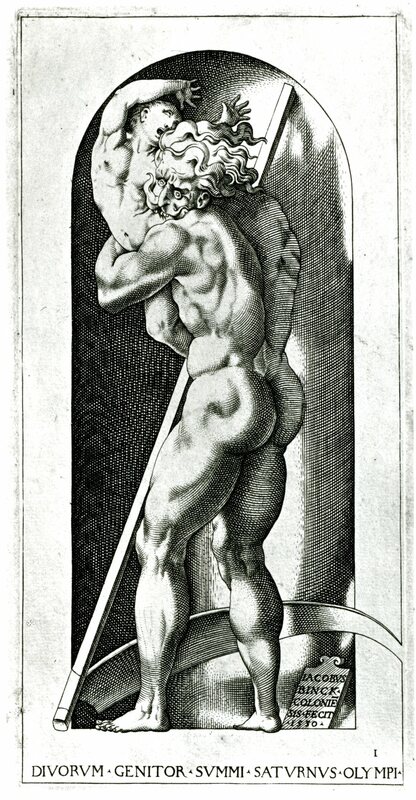 The second copies have something of the character of Goltzius’s prints but without their remarkable bravura. E.117, 1 – 20. Anonymous. 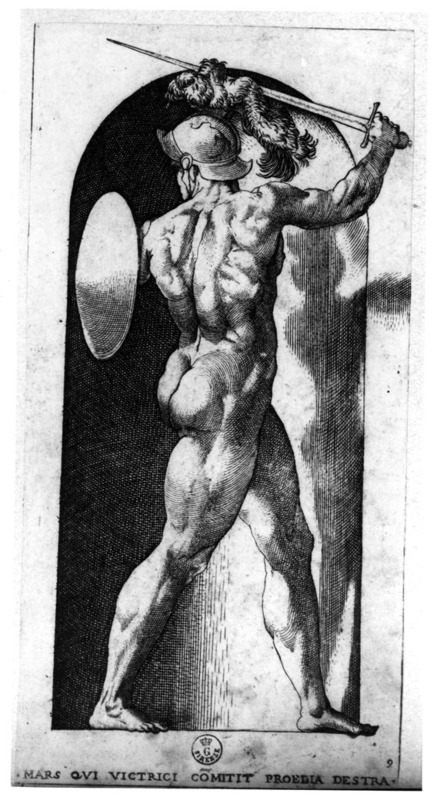 Twenty engravings after Jacob Bink’s copies of Caraglio’s prints, with white borders, reversed, smaller and without inscriptions; the plaque within the niche of Saturn is missing. 13.7 x 7.1 P, 12.6 x 5.4 niche (Opis, Vienna). Numbered 1 – 20 in various places at the bottom. Bartsch, XV, 1813, 79-80, as copies after Caraglio. Le Blanc, 1854-1890, I, 589, B, under 29-48. COLLECTION: Vienna, H.B.IV, Supplement, pp. 59-60, nos. 221-240. LITERATURE: Thirion, 1971, 33, as probably from the end of the sixteenth century. Borea, 1980, 248, under no. 618. Henriette Pommier, Dessins … de Lyon, 1984, 26. Boorsch and Spike, I.B., 28, 1985, 161-170 (Vienna). Carroll, 1987, 125, n. 127, under nos. 21-40. Massari, 1989, 120. Several details of these engravings indicate that they are derived from Bink’s copies of Caraglio’s prints. There is no landmass on the lower part of the globe of the earth in the Jupiter; no shadow appears below the goddess’s lower hand in the Diana; and the bottom part of the lance of Minerva is more as in Bink’s print than in Caraglio’s. The actual engraving of the prints gives no indication that they are based on the copies after Bink’s print. The shadow in the Ceres in the small reversed copy preserves something of the original devil-like shape that it has in Caraglio’s print and in Bink’s copy but which has quite disappeared in the large copy after Bink. E.118, 1 – 17. Anonymous. Twenty? 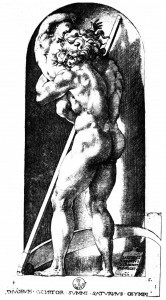 engravings (17 known) after Caraglio’s prints (? ), with white borders, reversed, and the same size. Inscriptions in smaller letters than those of Caraglio’s prints; the plaque within the niche of Saturn is missing. Some of the prints are numbered: Saturn, 1; Juno, 4 (instead of 3); Jupiter, 3 (instead of 4); Venus, 10; Diana, 12; Mercury, 13; Bacchus, 17; Ariadne, 18; Vulcan, 19. COLLECTION: London, VA, 28410, 1 – 20, in Press I.2.C (but only seventeen prints; missing: Opis, Pluto, Hercules). LITERATURE: Carroll, 1987, 125, n. 27, under nos. 21-40. These are rather roughly and scratchily executed copies. It still has to be determined from which prints they were derived. There is no inscribed tablet in the niche of the Saturn, and the right foot of the god turned into the niche is very awkwardly foreshortened. E.54, 1 – 20. Jacques Androuet Du Cerceau. Twenty etchings after Bink’s prints, with white borders, in reverse, and the same size. 22.2 x 10.2 L (Paris). Inscriptions in a style of lettering different from that of Bink’s prints (on the wording of them, see below). Numbered at the lower right, but 5, 6, 14, 15, and 20 unnumbered. Le Blanc, 1854-1890, I, 45, 1 – 20. COLLECTION: Paris, Ed 2h, Vol. II. LITERATURE: Geymüller, 1887, 32, 137, Fig. 57 (Mercury), 148, 323, believes that they were made from Caraglio’s prints and not from Bink’s copies. Linzeler, 1932, 35-36 (as Paris, Ed 2b), thinks their dimensions indicate that they were made from Bink’s engraving. Bosquet, 1964, 174-175, Figs. (Minerva, Thetis, Hera, Ceres, Opis). Thirion, 1971, 33. Borroni and Kozakiewicz, 1976, 617. Borea, 1980, 248, under 618. Henriette Pommier, Dessins … de Lyon, 1984, 26. Carroll, 1987, 125, n. 27, under nos. 21-40. Massari, 1989, 120. Brugerolles and Guillet, 1994, 66, n. 6, and Fig. (Bacchus, Ensba), as done around 1550 (Fig.Du Cerceau, Bacchus). Where several of the inscriptions on these prints differ from those on Caraglio’s engravings, they are specifically related to those on Bink’s copies; see especially the Mars, Diana, and Minerva. Du Cerceau would, therefore, have worked from Bink’s copies. E.119, 1 – 4. Anonymous. Engraved copies of Opis, Juno, Ariadne, and Vulcan, with white borders, in the original direction, and the same size. LITERATURE: Carroll, 1987, 125, n. 27, under nos. 21-40. These four prints give evidence of the possibility of other sets of copies of the Gods in Niches. The Juno, Ariadne, and Vulcan seem in the engraving of the figures to belong together. The Opis appears less smoothly engraved. E.119, 1. Opis. Inscribed: OPIS • SATVRNI . CONIVNX • MATEQVE • DEORVM (the Ns backwards); numbered at the lower left: 2. Thirion, 1971, 40, Fig. 27, as Caraglio (Paris). The spelling of MATEQVE here is unique in prints of the Opis. E.119, 2. Juno. Inscribed as in Caraglio’s print but with slightly different lettering. Boorsch and Spike, IB, 28, 1985, 104, as Caraglio (Berlin). The tip of the drapery projecting to the left against the dark of the niche to the left of Juno’s left leg is unshaded; the legs of the peacock are smooth; and the edge of the dark shadows does not have fine shading. E.119, 3. Ariadne. Inscribed as in Caraglio’s print (the dots at the ends unknown) but with the S backwards and the two Ms with outwardly slanting uprights; numbered at lower right: 18. Thirion, 1971, 40, Fig. 7, as Caraglio (Paris, cut at sides, including part of number). E.119, 4. Vulcan. Inscribed as in Caraglio’s print but without the dots and with a caret-like dot over the I in MI. Thirion, 1971, 35, Fig. 6 (Paris). E.120. Anonymous. Small copy of Vulcan in the original direction. Engraving, 12.1 x 5.9 L, 12.2 x 6.1 P. Inscribed in the margin below: ‘ AVREA ‘ MI ‘ CONIVNX ‘ VENUS ‘ EST ‘ SATURNIA ‘ MAT (the N’s backwards), and numbered at the lower left: 19. COLLECTION: London, 1978-12-16-56 (in C58*). LITERATURE: Carroll, 1987, 125, n. 27, under nos. 21-40. 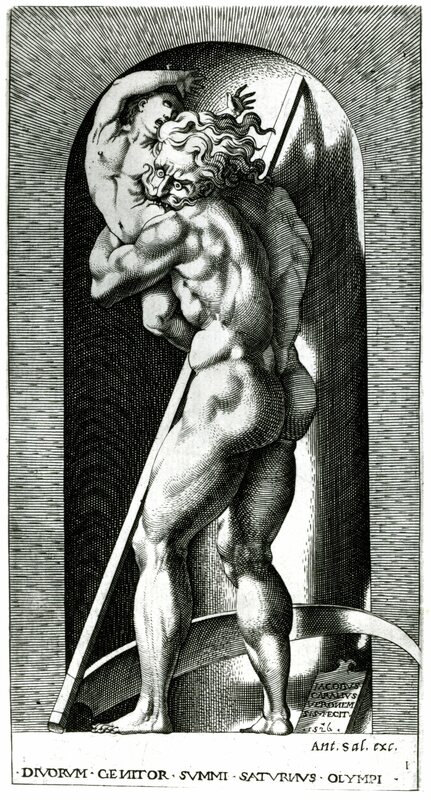 The technique of this very fine engraving suggests Etienne Delaune’s. As the four N’s of the inscription are backwards, this copy may have been derived from Caraglio’s original print (E.44). E.121. Anonymous. Copy of Jupiter, with white border, in original direction and size. Etching. COLLECTION: Berlin, 272-115. E.122, 1 – 13. INCOMPLETE VARIANT SERIES: Anonymous. Twelve or thirteen engravings with dark borders, in original direction and size, without inscriptions, and unnumbered, derived from the Villamena edition. Of the twenty of the original set by Caraglio, this set contains (see Vienna, below) no. 1, Saturn (Fig.E.122, 1); no. 2, Opis (Fig.E.122, 2); no. 3, Jupiter (Fig.E.122, 3); no. 6, Thetis (Fig.E.122, 4); perhaps no. 7, Pluto (in Passavant, but not found); no. 9, Mars (Fig.E.122, 5); no. 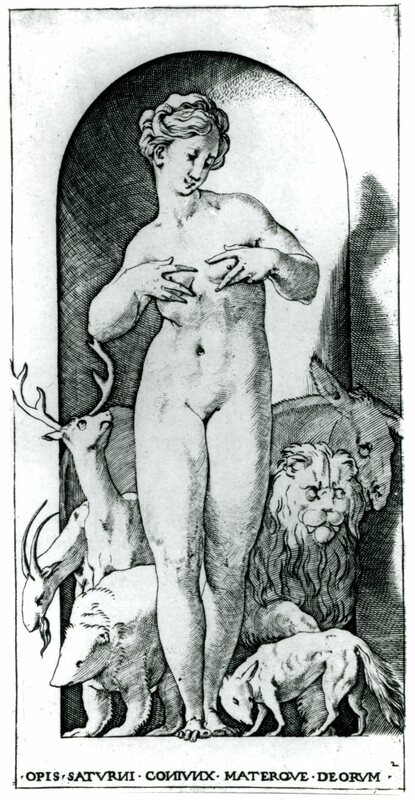 12, Diana (Fig.E.122, 6); no. 13, Mercury (Fig.E.122, 7); no. 14, Ceres (Fig.E.122, 8); no. 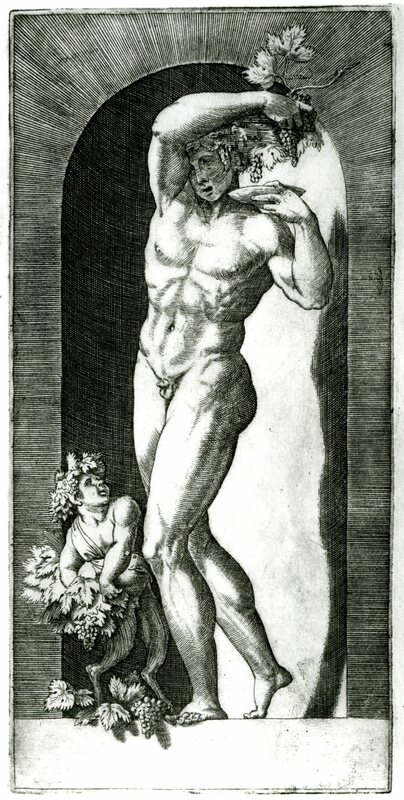 15, Hercules (Fig.E.122, 9); no. 17, Bacchus (Fig.E.122, 10); no. 18, Ariadne (Fig.E.122, 11); and no. 19, Vulcan (Fig.E.122, 12). 22.5 x 11.1 P; the margin below, 1.9 x 10.9; the niche, 18.7 x 8.1 (Saturn, Vienna). Bartsch, XV, 1813, 80-84, as engraved in the same style as Marcantonio’s seven Virtues and hence probably by him. Passavant, VI, 1864, 96, adds Pluto. COLLECTIONS: Berlin, 691-115 (Opis), 273-15 (Jupiter), 695-115 (Diana), 696-115 (Ariadne). Bologna, C. 626 (461) (Opis), C. 631 (462) (Thetis), C. 632 (463) (Mars), C. 640 (464) (Diana), C. 641 (451) (Jupiter), C. 648 (465) (Ceres), C. 649 (466) (Hercules), C. 650 (485) (Bacchus), C. 651 (484) (Ariadne). Chatsworth, Vol. 27, p.78, no. 99 (Bacchus), p.80, no. 101 (Hercules), p.81, no. 102 (Mercury). London, Caraglio Vol. C53, p.38, upper right (Saturn), p.41, upper right and lower left (Mercury), p.45, upper right (Hercules). London, VA, Press I.2.C, no. 27878.6 (Thetis), 27878.8 (Mars), 27878.9 (Venus), 27878.11 (Diana), 27878.13 (Hercules). Paris, Eb 6b Rés. (Vulcan, with drapery in ink added across hips; Saturn). Vienna, H.B.IV, Supplement, pp. 64-66, nos. 244-255 (all except Pluto). LITERATURE: Kusenberg, 1931, 157, 162, as by the School of Marcantonio (with no mention of the Pluto). Ferrara and Gaeta Bertelà, 1975, nos. 153-160, with Figs. (Bologna). Boorsch and Spike, IB, 28, 1985, 171-182 (Berlin and Vienna). Carroll, 1987, 125-126, n. 27, under nos. 21-40, as possibly of the eighteenth century. Massari, 1989, 119, as another version of the series by Caraglio. The Pluto that Passavant catalogued as part of this set has not been found. Bartsch specified some of the differences of these prints from what is found in Caraglio’s original prints. He also noted that they are engraved entirely differently and hence refers to them as repetitions rather than copies of the original engravings. Recognizing them as resembling in their style Marcantonio’s seven Virtues, he concludes that they are probably by this engraver. In addition to lacking the inscriptions of the originals, two of them, the Saturn and the Vulcan, are unfinished. Given that six or seven of the original set are unknown in this set, it seems unlikely that more of the original twenty of Caraglio’s set were begun. These prints are very beautifully engraved, but their technique is less regular than Marcantonio’s. Furthermore, no prints by Marcantonio that show niches and figures in niches with dark wall area around them, including his seven Virtues, show these areas as they are in these Gods in Niches. In the latter, the shading is created by long straight lines only that radiate out from the curved top of the niches. Such radiating lines do not occur in Marcantonio’s prints, where the engraved lines of shading run straight across the print and between the long parallel lines are placed very short ones. Also, in Marcantonio’s prints, the lines of shading inside the niches tend to curve more in relation to the curved surfaces of the niches. This evidence indicates that Marcantonio is not the engraver of these prints. 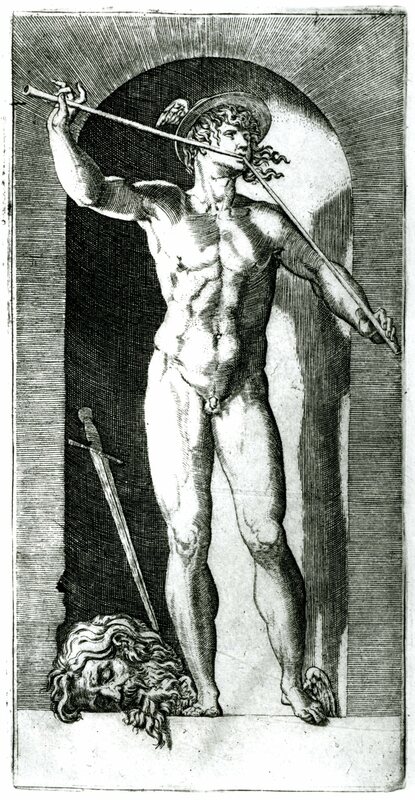 Bartsch points out that in the Saturn, the blade of the scythe curves upwards rather than downwards as it does in Caraglio’s print, and that in the Mercury, the sword, seen strongly foreshortened between the god’s legs in Caraglio’s print, is leaning, point down, against the interior of the niche. But it should also be noted that in five of the prints, the Saturn, Mars, Mercury, Ariadne, and Vulcan, small pieces of the edges of the niches have fallen away or are chipped. This ruinous condition is found in none of Marcantonio’s niches, nor does it seem to be found in any other sixteenth century prints with niches used for figures as in these prints. The faces of all the figures are slightly different from Caraglio’s, all the hair tends to be curlier, and clothing and plants are slightly elaborated. Three details of the prints indicate that they were engraved not after the first edition of Caraglio’s prints but after the Villamena edition of the early seventeenth century. First of all, the wall area around the niches is shaded. 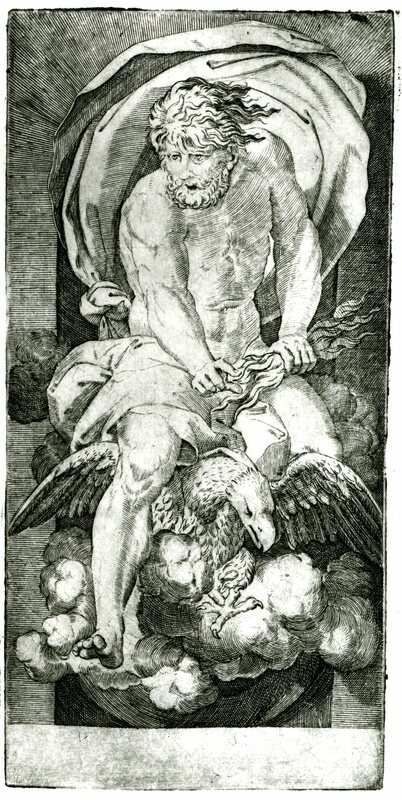 Second, the talons of the eagle in the Jupiter are white as in the Villamena print and not black as in Caraglio’s print, and the clouds under Jupiter’s right foot are as in the Villamena edition and not as in the original engraving. And last, there are claws on the paw of the lion skin in the Hercules that are found in only one other print of this image, Villamena’s. The variations from Villamena’s versions of Caraglio’s prints, the elaborations of details, and the appearance of the niches partly ruined point to a date after 1604. It is possible that the prints are of the eighteenth century. DERIVATIONS, PRINTS: RE.14, 1-20. Boyvin. Sixteen or Twenty Panels of Ornament with Pagan Gods. The Saturn of State I is inscribed to Thiry, State II to Rosso (Fig.RE.14,1). For specifications, see RE.14, 1-20. Melchior Lorck (Lorichs). Opis. Woodcut. Inscribed at the upper right: 15 FM 65 and below in Gothic lettering: Opis Saturni Coniunx Materque Deorum. Bartsch, IX, 1808, 510, 105, 2. COLLECTION: London (Fig.Lorck). Based upon Rosso’s Opis, but it cannot be determined from which print of it Lorck’s woodcut is derived. The image is so altered – the niche has been eliminated, a landscape with buildings added, and some of the animals have been changed and their number increased by two – that one cannot recognize Rosso’s style at all. But enough survives, including the Latin inscription, to make the connection with Rosso. Virgil Solis. Aurora. Engraving, 8.4 x 5.3 S. Inscribed at the lower left with Virgil Solis’s monogram. Bartsch, IX, 1808, 257-258, 105. COLLECTION: London, 1874-7-11-1883. LITERATURE: Bousquet, 1864, 174, Fig., as based upon Du Cerceau’s Minerva. 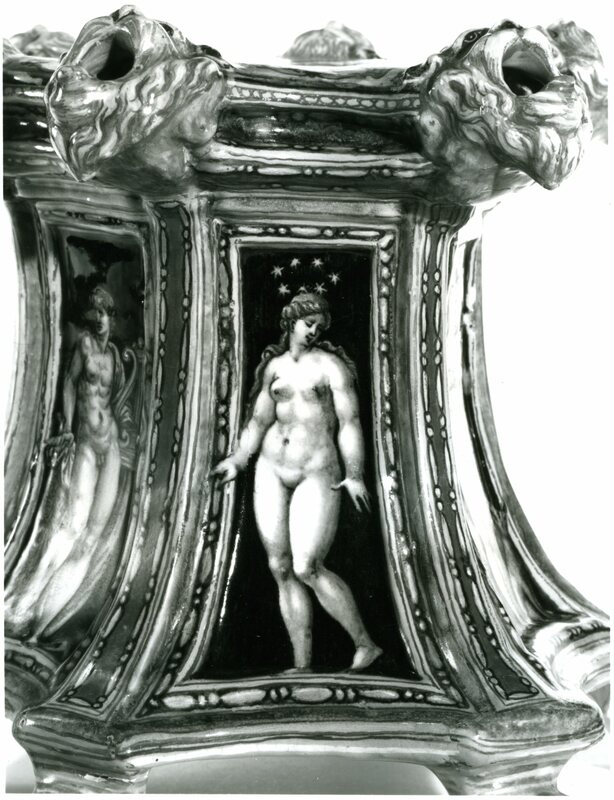 This figure with a vase and set within an architectural setting is based upon Rosso’s Minerva, but it was not necessarily derived from Du Cerceau’s print of it as Bousquet believes. Any of the prints of this image could have been Solis’s direct source. Virgil Solis. Female Figure in an Architectural Setting. 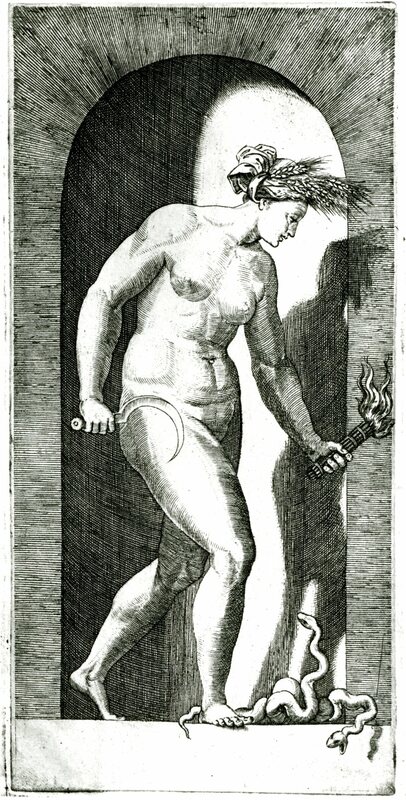 Engraving, 8.3 x 5.2 S. Bartsch, IX, 1808, 258, 106. COLLECTION: London, 1867-4-13-640. 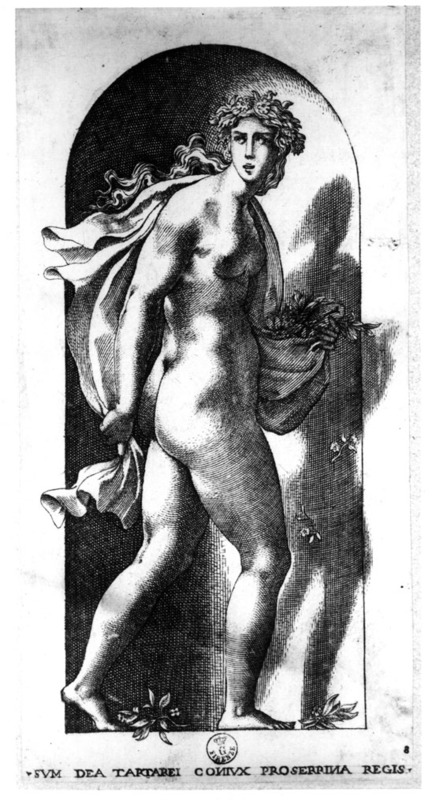 This figure is based upon Rosso’s Juno. Virgil Solis. Ceres. Engraving, 5.7 x 4.4 L. Inscribed above: AEMA • CERES • RESDOCVIT • SE / GTVM SPEM CREDERE / SVICI S 4 followed by Solis’s monogram. Passavant, IV, 1863, 117, 568. COLLECTION: London, 1930-7-16-25. This figure in a landscape with buildings is based upon Rosso’s Juno. The inscription beginning with AEMA seems to indicate that Solis worked from Bink’s copy of Caraglio’s print, although Solis added words to his text. Jacques Prévost. Cybele. Signed and dated 1547. Robert-Dumesnil, VIII, 1850, 5, 2. Herbet, 1900, 341, (1969, 191), 2. 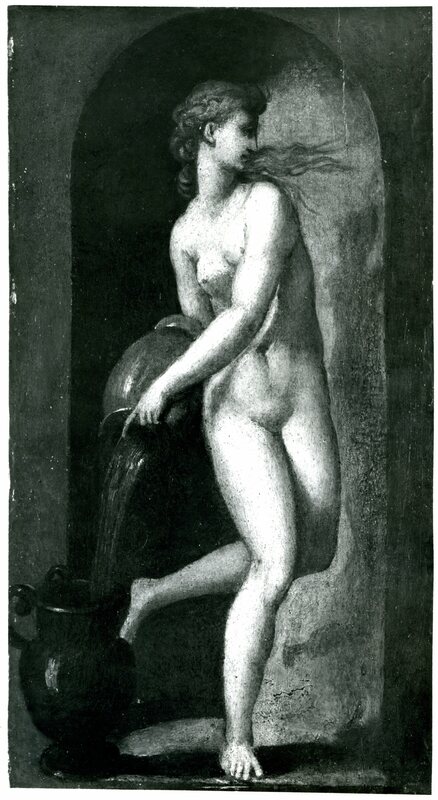 The image of this print is not dependent upon a print by Caraglio but the inscription beneath the figure is identical to that beneath the Opis. This inscription does not match the figure represented in Prévost’s print. Attributed to Primaticcio. One might note here that Malvasia, according to Herbet, IV, 1900, 342 (1969, 192), without stating a source, which I have not been able to find, thought that a set of the Gods in Niches including Jupiter, Neptune, Pluto, Proserpina, Diana, Apollo, Vulcan, Hercules, and Ceres might be by Primaticcio because an impression of the Jupiter he knew was inscribed with that name. As Herbet pointed out, this form of Primaticcio’s name was not used in the sixteenth century, but several of Caraglio’s prints of the Gods in Niches do bear this name (but written and not printed, he would seem to mean). Herbet also indicates that these inscribed prints could be copies of Caraglio’s prints. However, they would not have been by Primaticcio. But if the prints that Malvasia and Herbet knew were etchings then they might have been impressions of the reversed copies by Du Cerceau. COPIES, DRAWINGS. While the sources of these copies in Rosso’s images are evident, I have not in every case determined which specific print was used. Berlin, Hollstein and Puppel, May 4-6, 1931, no. 1249, from the W. Bateson Collection. Mercury. Pen and ink and wash, 15.5 x 9. 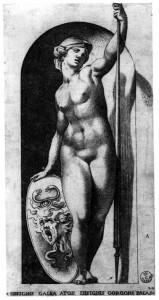 From the sales catalogue, without illustration, where it is related to Caraglio’s engraving. Budapest, Musée des Beaux-Arts, no. 2225. Opis (Fig.Opis, Budapest). Point of brush and wash heightened with white on blue-gray paper, 20.1 x 10. Inscribed at lower left: Rafaello d’Urbino. LITERATURE: Meder, Joseph, Handzeichnungen alter Meister aus der Albertina und anderen Sammlungen, Vienna, XII, 1908, no. 1413 (Fig. ), as Rosso. Kusenberg, 1931, 147, no. 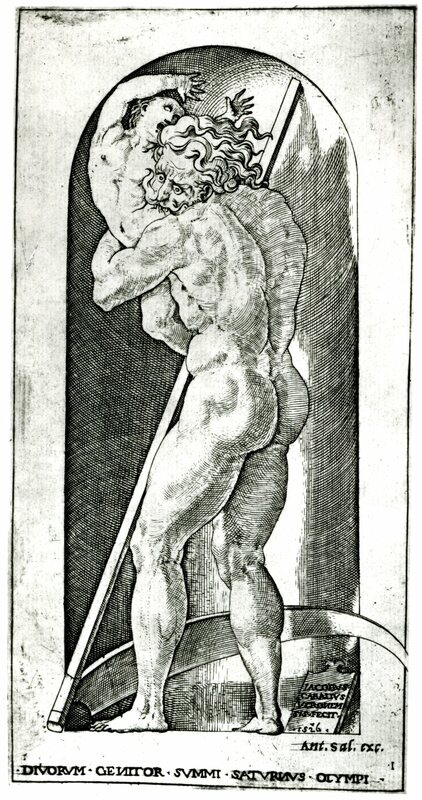 2, as a copy after the engraving. Chantilly, Musée Condé, L.V. 140. Opis, Minerva, and Juno (Fig.Opis, Chantilly). Black chalk heightened with white on tan paper, 21.8 x 32.4. Inscribed in ink at the lower right: Primaticcio. LITERATURE: Kusenberg, 1931, 147-148, no. 3, as copies of the prints. 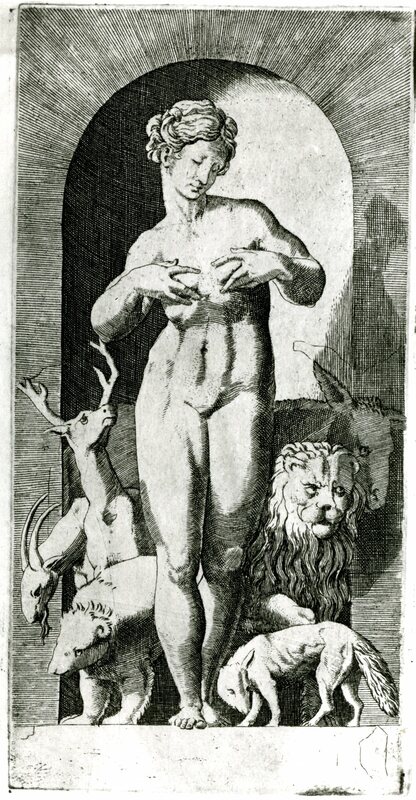 The drawings are actually rather free variations of Rosso’s figures; Opis is shown with an elephant, a lion, a rabbit, a deer, and a snake. Geneva, Melvin M. Fagen Collection. Opis (Fig.Opis, Geneva). Pen and brown ink and brown wash, with a blue wash, with some brown and yellow shading appearing at the back of the niche and covering all the animals except the fox at the lower right, 20.4 x 11.4. Inscribed in ink at the lower right: Leonardo; also inscribed with the text of Caraglio’s print, with the letters more widely spaced so that it occupies a longer line, with the first word and last words obliterated. PROVENANCE: Luigi Grassi (Lugt 1095, at the lower left). I have seen only a photograph of this drawing taken with ultra-violet light; only in this light are the animals visible, Mr. Fagen informed me. 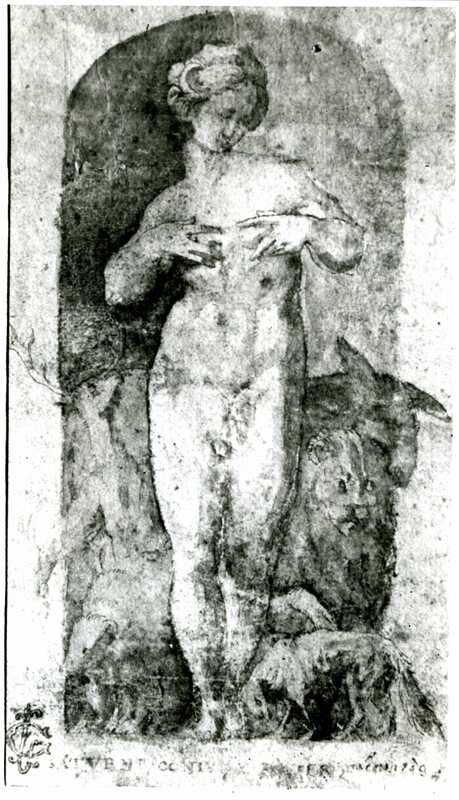 From this photograph, the drawing does not resemble, either technically or graphically, Rosso’s drawings in Lyons (Fig.D.17A), Paris (Fig.D.17B; Fig.D.17C), and Besançon (Fig.D.18a) for the Gods in Niches. 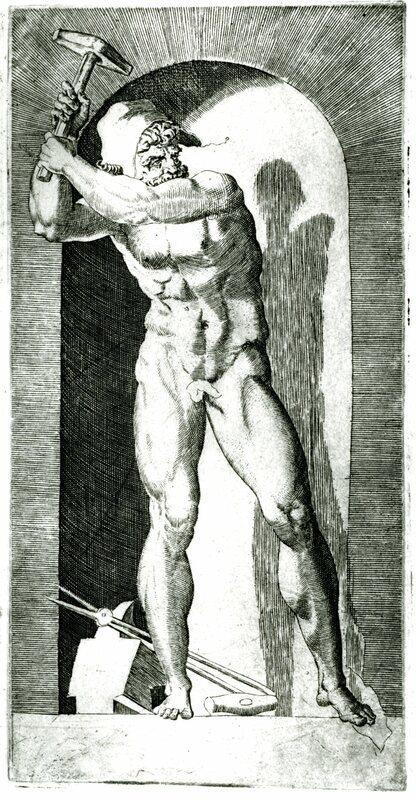 The Fagen drawing appears to be a copy of Caraglio’s engraving or one of the copies of it. The flatness of the arc of the niche would almost certainly not have been intended by Rosso, as the very crispness of the full arc in the engravings and in his drawings for them is an essential factor in the liveliness of these images. Florence, Uffizi 424S. Neptune (Fig.Florence, 424S). 21.4 x 13.5. Inscribed in ink at lower left: Marzilla. 425S. 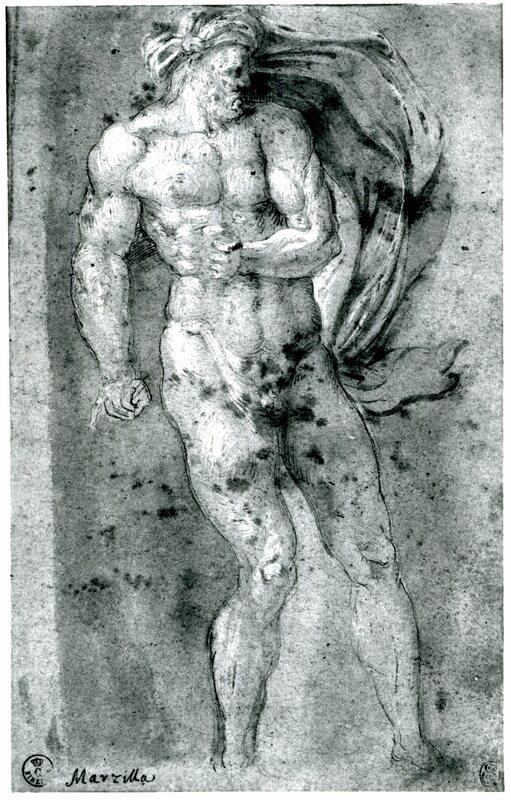 Vulcan (Fig.Florence, 425S). 24.4 x 13, inscribed in ink at lower right: Primaticcio; and in pencil in the lower left corner: 9. 426S. 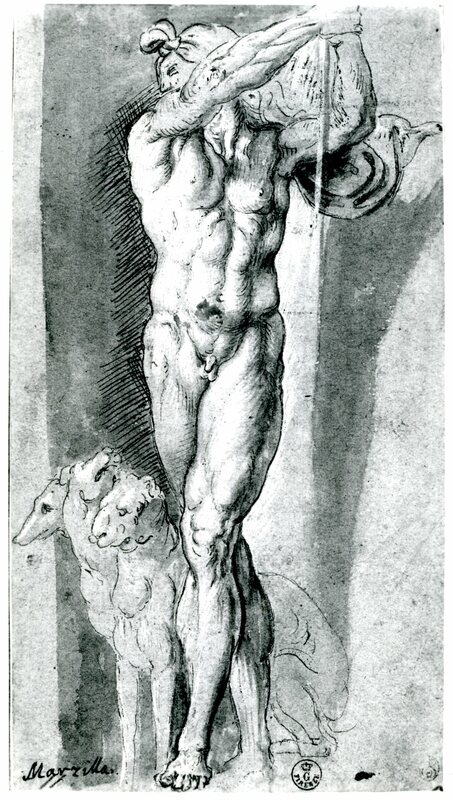 Hercules (Fig.Florence, 426S). 21.5 x 14.8, inscribed in ink at the lower right: Marzilla; in red chalk at lower center: Caraglio; and in pencil at the lower left: 10. 427S recto. Pluto (Fig.Florence, 427S). 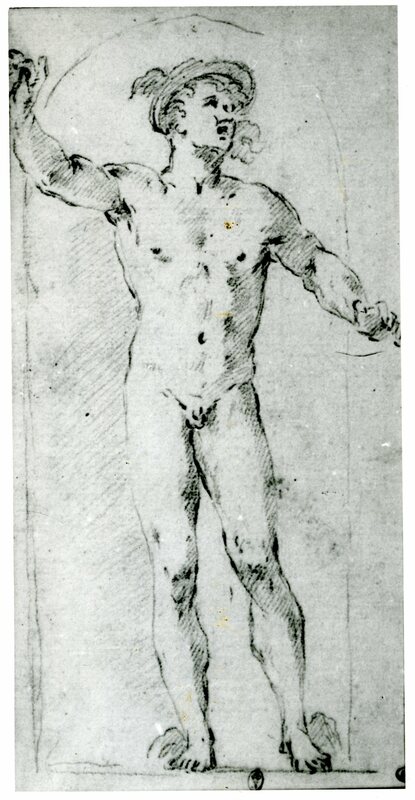 22 x 12.3, inscribed in ink at the lower left: Marzilla, and in pencil: 11; the figure is perforated for transferring (the verso shows drapery falling over the left leg of a seated figure, probably unrelated to Rosso; Fig.Florence, 427S verso). 428S recto. Ceres (Fig.Florence, 428S). 21.3 x 13.8, inscribed in the lower right corner: Marzilla; in red chalk at the right side above: Caraglio; and in pencil at the lower left: 12; the verso shows Thetis (Fig.Florence, 428S verso). 429S. Proserpina (Fig.Florence, 429S). 21.2 x 11.8, inscribed in ink at lower left: Marzilla; also, in pencil, the number 13. All of these drawings are executed in pen and ink and wash, heightened with white, on light blue paper; some of the whites have oxidized. 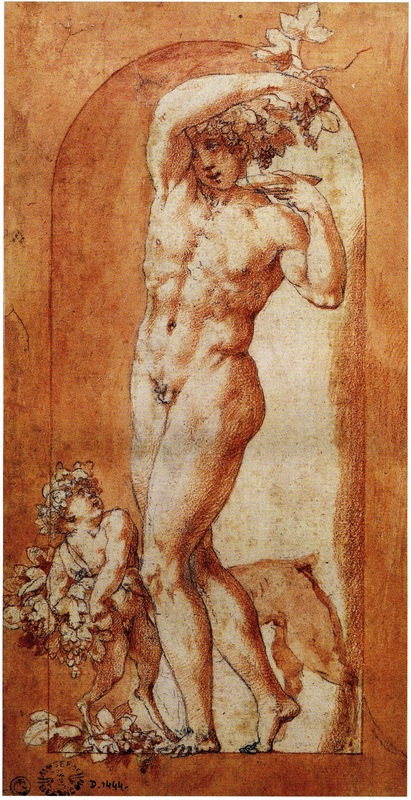 The drawings are under Primaticcio in the Uffizi. LITERATURE: Gaudioso, 1976, 38, n. 38, mentions these drawings, except the Thetis, and suggests that the inscription on them, which he incorrectly gives as Marcilla, refers to Guillaume de Marcillat. Copied after the prints with white borders; these sixteenth century drawings appear to be by a North Italian artist. London, Christie’s, Nov. 20-21, 1958, Lot 188c. Mercury. Pen and ink and wash, heightened with white, 19.8 x 12.1; crest in gold; large armorial stamp. Old inscription: Giorgio Bos. Catalogue of the Well-Known Collection of Old Master Drawings principally of the Italian School formed in the 18th century by John Skippe, now the property of Edward Holland Martin, Esq., London, Christie’s, 1958, p.133, as after Rosso. Bought by P. Class. 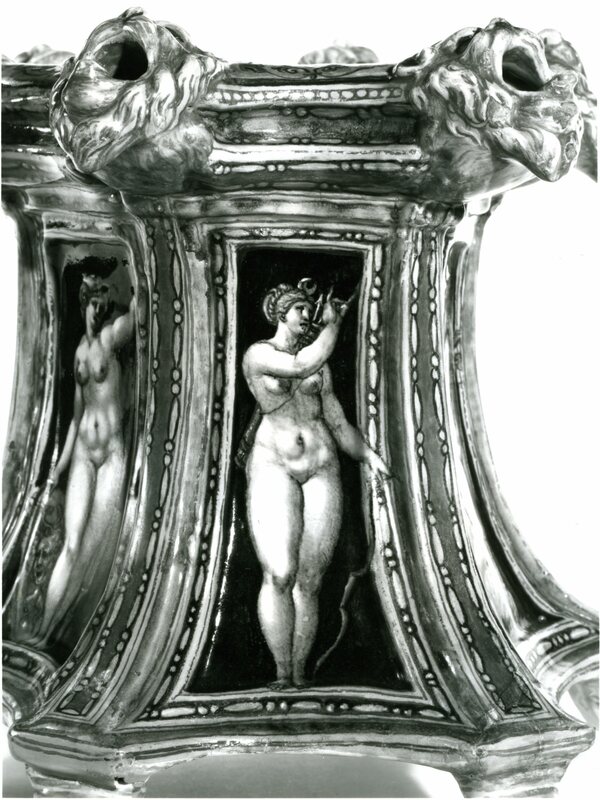 The description in the catalogue indicates that this drawing is related to the engraved variant of the Mercury that shows the sword leaning against the side of the niche. 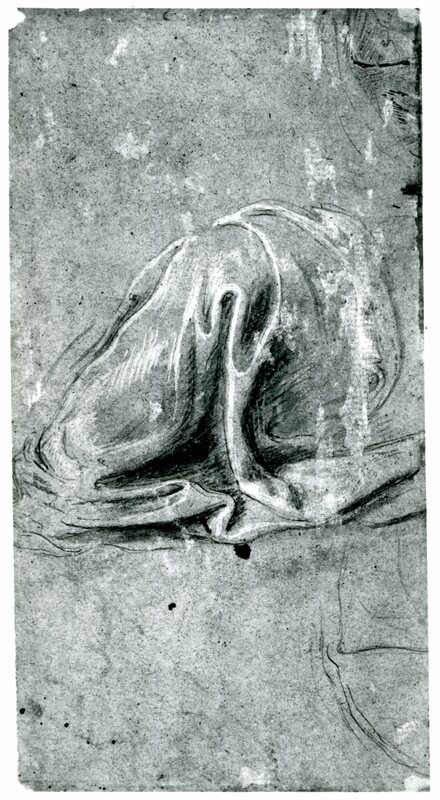 It would be interesting to locate this drawing to see if it is copied from or is the model for the print. London, Sotheby’s, 10 October 1974, as after Rosso. Mercury (Fig.Bern, 1960). Pen and ink and wash, heightened with white, on lilac washed paper. 20.7 x 12.2 (Fig., BM, CXVI, Sept., 1974, iv, as after Rosso). PROVENANCE: C.R. Rudolf Collection; Berlin, Amsler and Ruthardt, 1896, Cat. no. 53, lot 118, as Caraglio; Leipzig, C.G. Boerner, Handzeichnungen alter Meister des XV bis XVIII Jahrhunderts aus dem Besitze von frau Geheimrat Ehlers-Göttingen and andere Beiträge an Priratbesitz, dabei die Sammlung Dr. Gaa-Mannheim, May 9-10, 1930, 65, no. 358, Pl. XXXV, as Rosso, and formerly in the Grahl (Lugt 1199) and Hasse Collections; Berkeley, E. Rosenthal Collection (photo, Florence, Kunsthistorisches Institute); Bern, Klipstein and Kornfeld, June 16, 1960, cat. no. 224, Pl. 21, as Rosso; Location?, A. Matthews, autumn, 1960, cat. no. 57, no. 236 with Fig. 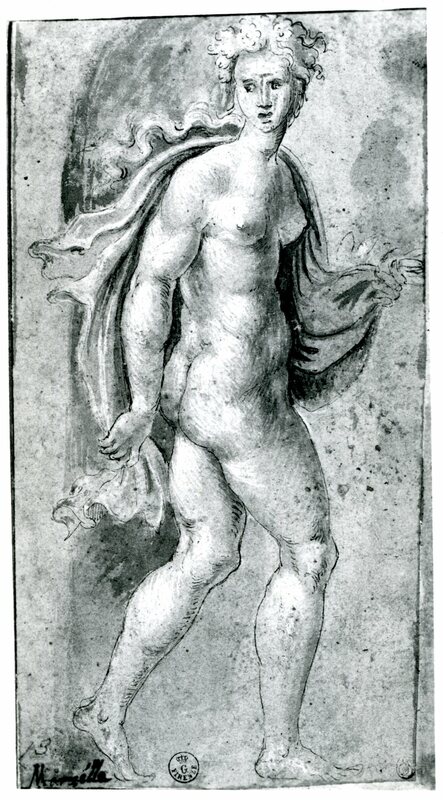 This sixteenth century drawing shows only the figure, in the original direction. It may be German. Formerly London, DeBeers Fine Arts Ltd. (in 1959). Thetis (verso: a man’s head, cut, not related to Rosso). Black lead. In the lower right corner, stamped ED [Eugène Delacroix]. Formerly London, DeBeers Fine Arts Ltd. (in 1959). Diana. Pen and ink over traces of black chalk, approximately the same size as the print. (Formerly?) New York, Herbert E. Feist Gallery. Juno (Fig.New York, Feist, Juno). Metal point and brown ink, heightened with white, on prepared paper, 31.1 x 20.3 (information from the catalogue Italian and French Master Drawings, May-June, 1974, p.2, no. 1, Fig. p.2). Inscribed in ink at upper left: Tertia; and at upper right: Rossi invenit. All along the left edge of the drawing is a line of writing in ink (in Latin?) that begins, it seems from a photograph: IUNO… (not the same as the inscription on print). 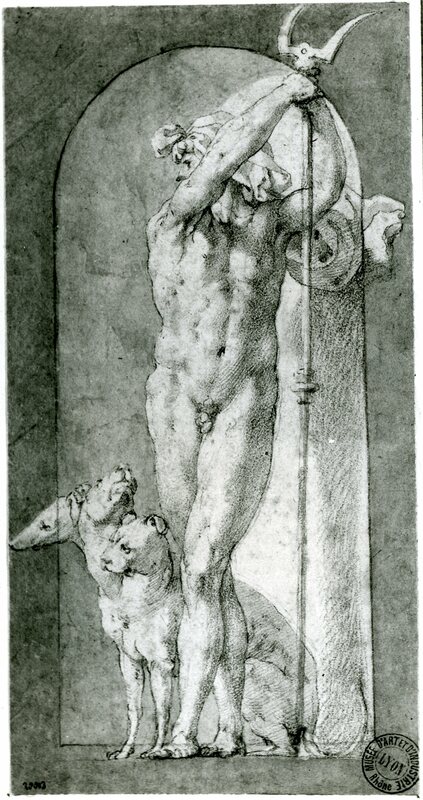 This drawing is in reverse of Caraglio’s engraving and hence must have been drawn from the anonymous small copy of the print, from the large reversed copy known from an impression in the Victoria and Albert Museum in London, or from the copies by Du Cerceau. Sixteenth century, probably North Italian. 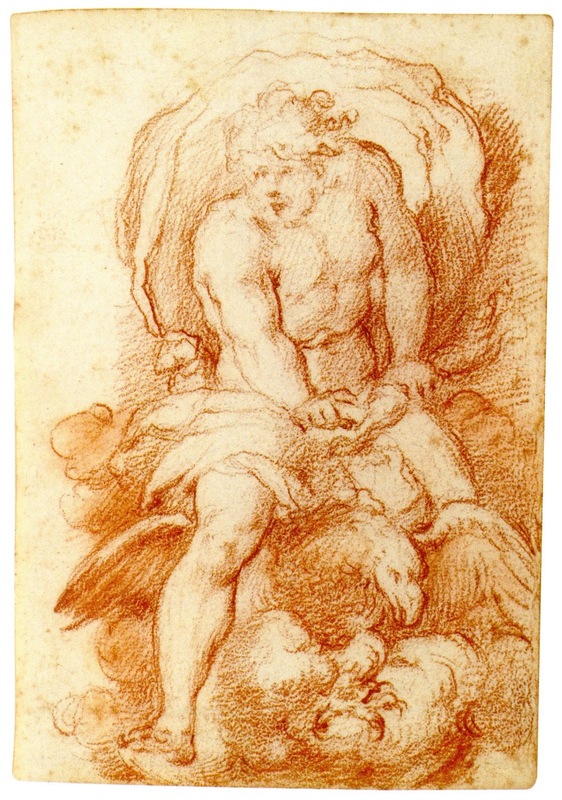 New York, Sotheby’s, Old Master Drawings, Sale N08711, 26 January 2011, Lot 511a, Jupiter (Fig.E.28, Copy, Drawing), red chalk, c. 16.8 x 11.3. After Caraglio’s print, E.28. 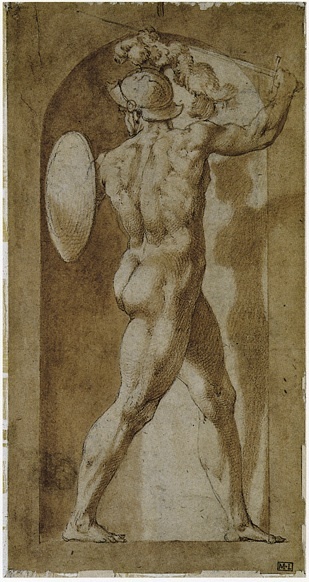 Sotheby’s catalogue notes that the drawing and a second after Rosso’s Hercules Shooting Nessus in the same lot (see E.19-24) show signs of stitching, suggesting that they come from an album, and that the draughtsmanship is close to the circle of Giovanni Battista Naldini. Nimes, Musée des Beaux-Arts, no. 211. 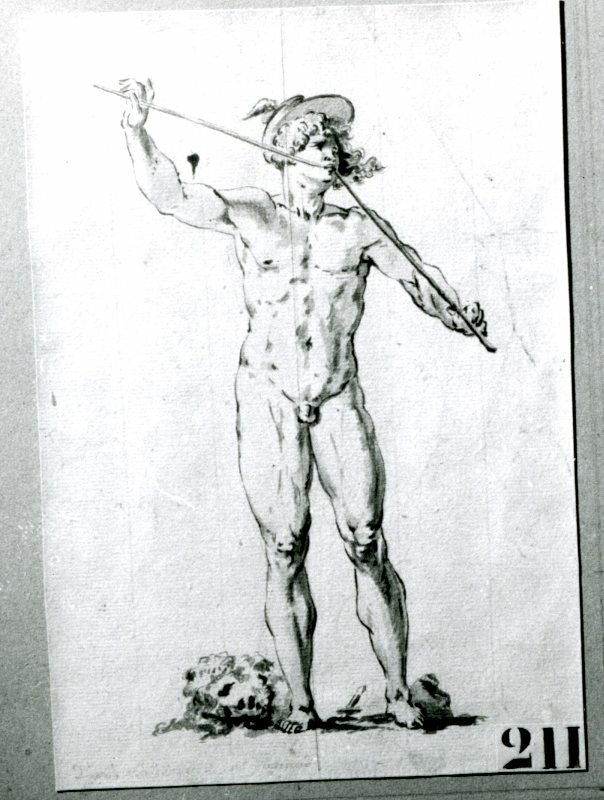 Mercury (Fig.Nimes). Pen and ink and wash over traces of black pencil, 23.1 x 15.6. Inscribed in pencil at the bottom: d’après l’original de M Renaud. Attributed in the museum to Christophe Jusky, as after a picture by the young Watteau. 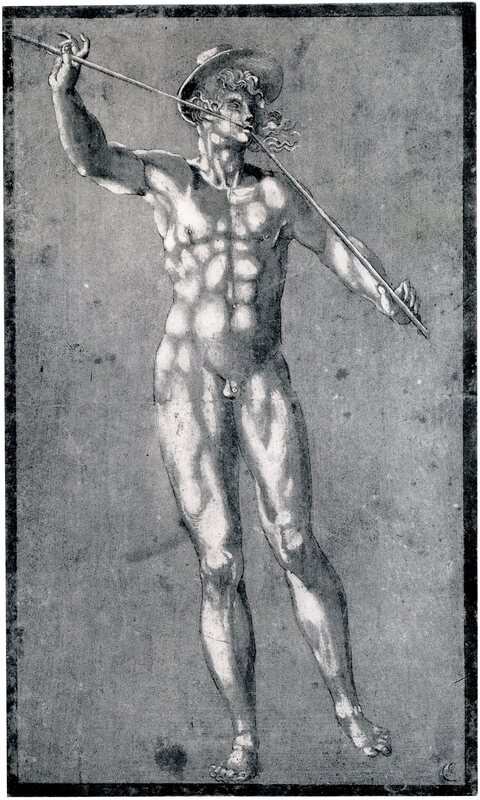 Copied after the Mercury with the sword between his feet as engraved by Caraglio. V. Lassalle, the conservator of the museum, kindly informed me that he does not know why the drawing is attributed to Jusky, a painter and engraver, born in Metz, who worked in the region of Nimes in the middle of the nineteenth century. Paris, Bibl. Nat., Cab. des Est. Ed 2p Rés. Du Cerceau, Façade of a Building. LITERATURE: Geymüller, 1877, 323, and Fig. 7. Kusenberg, 1931, 163. Linzeler, 1932, 35. Verdier, 1967, 172, n. 1. Birukova, in Actes, 1975, 54, 55, n. 12. The façade shows all of Caraglio’s figures in niches with the Venus in reverse. The additional four niches are filled by figures apparently invented by Du Cerceau. Paris, Louvre, Inv. 1597, I. Ceres (Fig.Paris, 1597, I). Red chalk over black chalk, 19.6 x 10; laid down. LITERATURE: Kusenberg, 1931, 149, no. 20, as from Rosso’s shop. See Louvre, Inv. 1597 II below. Paris, Louvre, Inv. 1597, II. 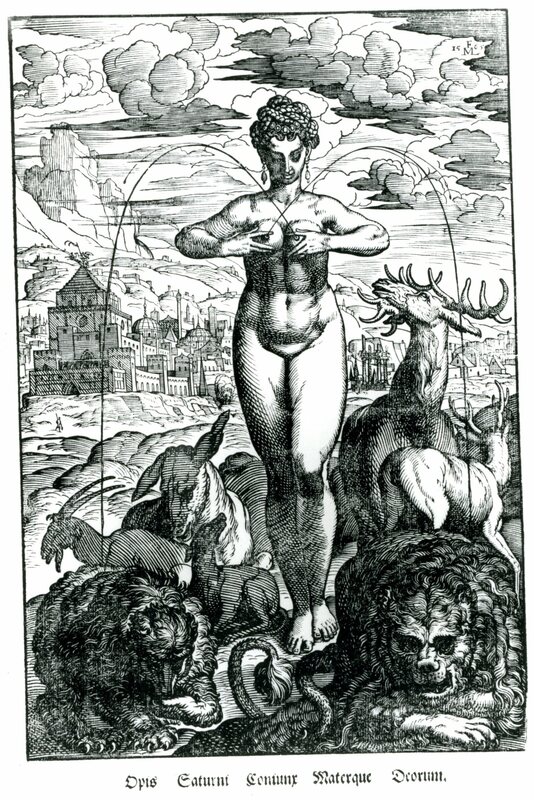 Mercury (Fig.Paris, 1597, II). Black chalk, 19.5 x 10.5; laid down. LITERATURE: Kusenberg, 1931, 149, no. 20, as from Rosso’s shop. 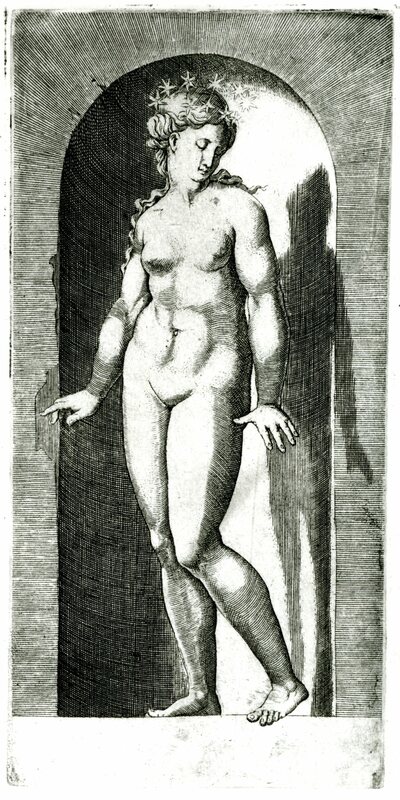 This and the preceding drawing, attributed to Rosso in the museum, are copies after Rosso’s figures, in the same direction as Caraglio’s prints, and with white borders. Both drawings are probably by the same hand, although the Ceres is more chiaroscural. Seventeenth century, or later? Paris, Hôtel Drouot, April 23, 1937. 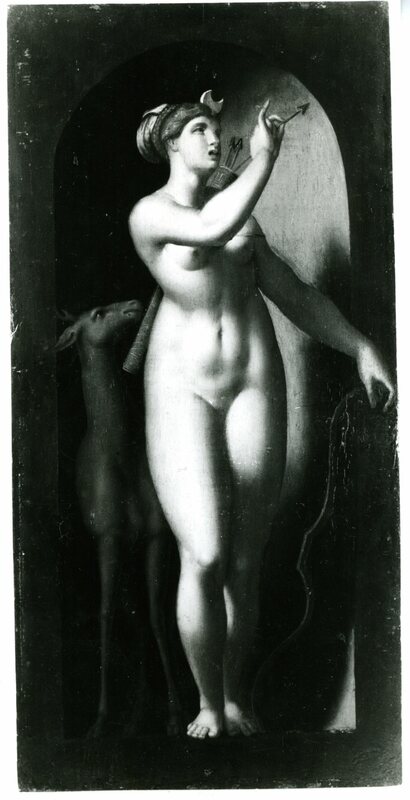 Diana (Fig.Paris, Drouot, Diana). Pen and ink and wash, 20 x 11. Catalogue des dessins anciens … provenant principalement de la Collection A. Sigwalt et de divers amateurs, lot 19, with Fig. Copied from the Diana of the incomplete variant set, which shows the deer with two ears and three arrows in the quiver. LITERATURE: Ramade, in Rennes, 1990, 216, no. 189, with Fig., the figure of Bacchus as after Rosso; in the catalogue of 1884 (C.433), as Italian School, sixteenth century. The figure of Bacchus with the small satyr is shown without the niche. 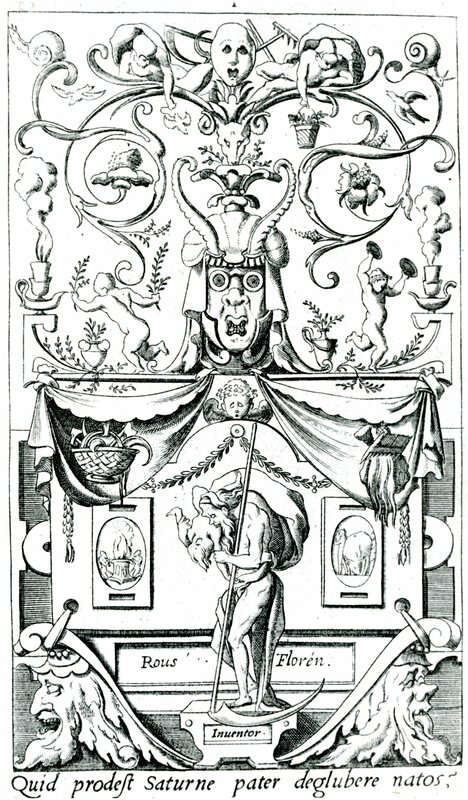 At the left is a drawing of a blank decorative shield with strapwork resembling the shields of the woodwork in the Gallery of Francis I, but not copied from them. The drawn shield does not have an oval center as those at Fontainebleau do. At the lower right is a lightly dressed young woman gracefully posed holding a piece of fruit up in the air. At the upper right are drawings of three circles, divided into sections, the upper one with numbers along the dividing lines. There are drawings of two heads in profile above the circles, and of classical architectural moldings at the upper left. My sense of the drawing is that it is a nineteenth century pastiche suggesting a page from an artist’s notebook in the manner of Leonardo’s notebooks, but here suggesting Rosso in France. Rio de Janeiro, National Library, no. C52 recto. Ceres. No. C52 verso. Hercules. No. C53. Mercury. Pen and ink and wash, heightened with white. The Ceres inscribed at the right: Pellegrino … (Peligrono) … d … Tibaldi. LITERATURE: Gilberto Ronci, “Disegni italiani nella Biblioteca Nazionale di Rio de Janeiro, Appunti per un catalogo,” BdA, XLII, 1957, 137, 147, n. 8, 136, Fig. 2 (Ceres). Ronci discusses and reproduces only the Ceres, but his description of the other two indicates that they, too, are copies of Rosso’s figures. 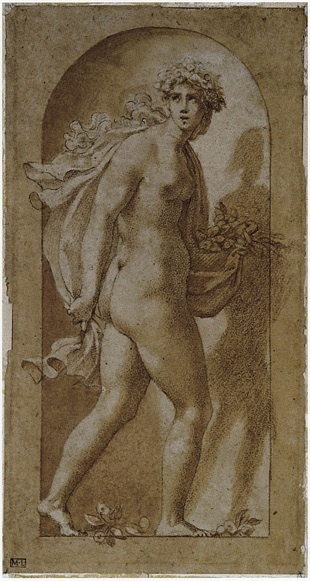 He attributes the Ceres to Pellegrino Tibaldi, but wrongly states that it is a companion to two drawings attributed to him in the Pinacoteca, Bologna. COPIES, PAINTINGS: Ancy-le-France, Château, ground floor near the chamber of Diana, Frieze with several Gods in Niches. LITERATURE: Thirion, 1971, 33. Arezzo, Museum, no. 16.15. Attributed to Poppi, Temperantia (Fig.Arezzo, 16.15). Panel, 30 x 16.15. Based upon the figure of Thetis and in the original direction, but the niche having a dark border. The painting could be based upon the re-cut plate attributed to Villamena or upon the print of the incomplete variant series. LITERATURE: Berti, Luciano, Il Museo di Arezzo, Rome, 1961, 42, as attributed to Poppi. Bologna, Pinacoteca Nazionale. Bartolommeo Cesi, Bacchus and Ariadne (Fig.Bologna, Cesi). Detached fresco from the Palazzo Riario – Sanguinelli in Bologna. LITERATURE: Cesare Gnudi, “Un affresco di Agostino Carracci acquistato per la Pinacoteca di Bologna,” Bollettino d’Arte, 38, 1953, 174-176. Calvesi, 1956, 269, as by Agostino Carracci, the figure of Bacchus based upon Caraglio’s Apollo. 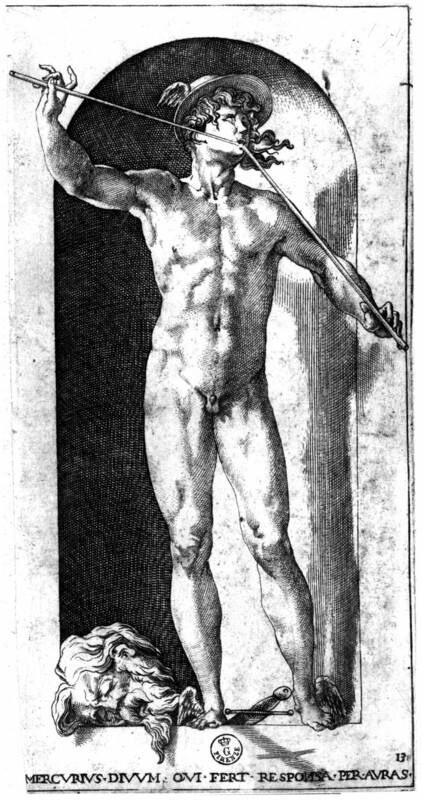 Ostrow, 1965, 127-134, as by Bartolommeo Cesi, the figure of Bacchus after Caraglio’s print. This attribution to Cesi was accepted by Harris, BM, CIX, 1967, 37. Bologna, Palazzo Fara. Agostino Carracci, Jason Delivering the Golden Fleece to Pelias, 1584. LITERATURE: Calvesi, 1956, 270, pointed out that the figure of Jason is based on Caraglio’s Bacchus. Ostrow, 1965, 131. 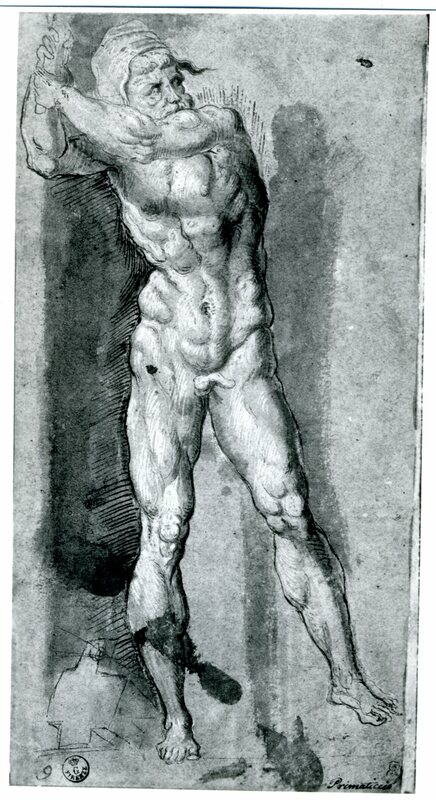 Although Carracci’s figure is reversed, bearded, and clothed, it may well be derived from Rosso’s figure, or from one of the reversed copies of it. Brussels, Musée des Beaux-Arts. Lambert Lombard, St. Dionysius Healing the Blind Man before the Temple of Mars. Krönig, 1974, 138, Fig. 21, 140, points out that the two figures in the niches of the building in the background are based on Caraglio’s Pluto and Minerva. Because the figures are reversed, they would be based on the small anonymous copies (E.117, 1 – 20 and E.118, 1 – 17) or on those by Du Cerceau (E.54, 1 – 20). Florence, Palazzo Vecchio, Sala degli Elementi. 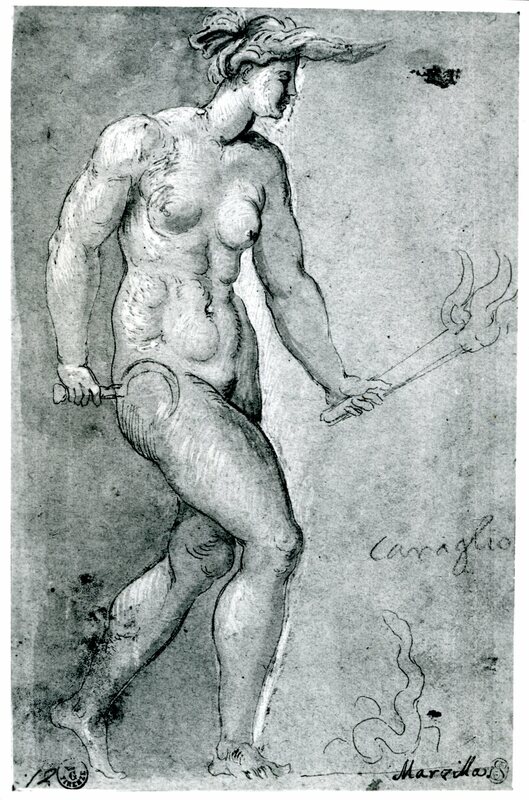 Vasari and Gherardi, Allegory of Fire. Ronen, 1977, 99-100, Figs. 16, 18, points out that the figure of the first cyclops is dependent upon Caraglio’s Vulcan. London, National Gallery. Rubens, Judgment of Paris. As pointed out by Michael Jaffé, “Rubens in Italy Part II: some rediscovered works of the first phase,” BM, CX, 1968, 176, 178, Fig. 4, the upper part of the figure of Minerva, seen from the back, is based upon Rosso’s Juno. Oldenburg, Gemälde-Galerie, no. 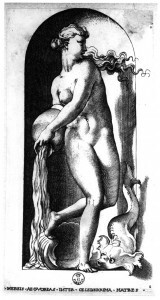 14, Venus (Fig.Oldenburg, Venus); no. 15, Ceres (Fig.Oldenburg, Ceres); no. 16, Diana (Fig.Oldenburg, Diana); no. 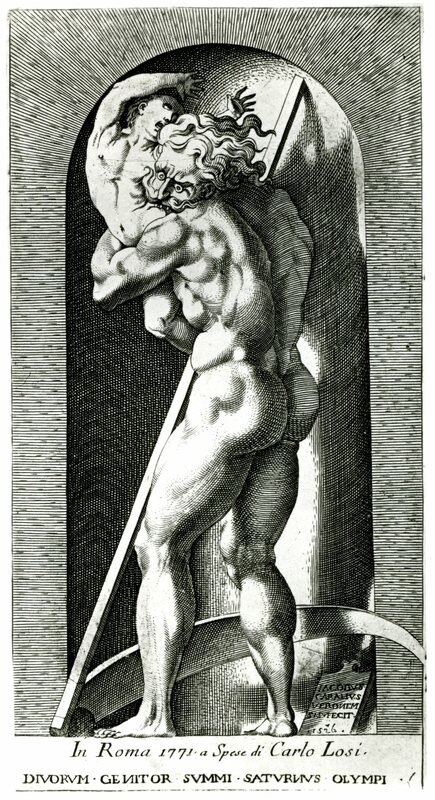 17, Jupiter (Fig.Oldenburg, Jupiter); no. 18, Pluto (Fig.Oldenburg, Pluto), cedar panels, 26.5 x 27.5. Acquired in 1869 from the Daigremont Collection. LITERATURE: Goldschmidt, 1911, 22, 50-51, as copies after Rosso. Voss, 1920, I, 189, as copies after Caraglio. Kusenberg, 1931, 129, reports that the museum attributed them to a Romanized Dutchman. Venturi, IX, 5, 1932, 231, as derived from Caraglio’s prints. Herbert Wolfgang Keiser, Gemälde-Galerie Oldenburg, Munich, 1965, p.54, and Figs. Carroll, 1987, 126, n. 28, under nos. 21-40. As the paintings show dark walls around the niches, it is possible that they were done from the Villamena edition of Caraglio’s prints or from the copies of that edition. Rome, Castel Sant’Angelo, Cortile del Teatro. Six Gods in Niches, based upon Rosso’s Neptune, Mars, Apollo, Venus, Mercury, and Minerva. Fresco, niches c. 130 cm high; niches, brick red, figures, tan, details, green. Gaudioso, 1976, 26, 38, n. 38, Fig. 28 (Apollo). Massari, 1989, 119, 125, Fig. 26, 129, Fig. 27, 130, Fig. 28, 131, Fig. 29, 133, Fig. 30, 140, Fig. 31. Based upon Rosso’s figures, and all in the original direction, except the Mars. The latter could, therefore, be based on the small anonymous copies (E.117, 1 – 20 and E.118, 1 – 17) or on Du Cerceau’s (E.53, 1 – 20). Gaudioso seems to suggest that the series of figures in the Castel Sant’Angelo was once larger. Strasburg, Museum. H. met de Bles, Landscape with Diana. Max J. Friedländer, Die Altniederländische Malerei, XIII, 1924, 26, 81, Pl. 43, no. 87. 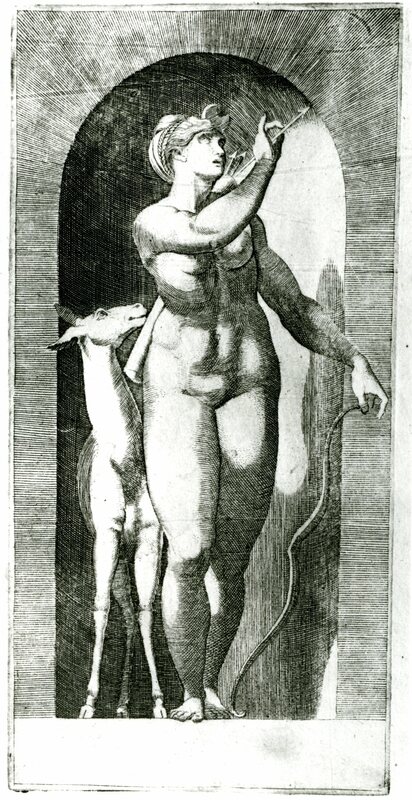 The figure of the goddess is based upon Caraglio’s Diana. Tanlay, Château, Guard Room. The Court of Henri II as Olympus. Ceiling fresco. LITERATURE: Geymüller, 1887, 148, n. 1. Verdier, 1967, 172, n. 1. McGovern, 1985, 33, 34, Figs. 1-2, 255, n. 72, with bibliography. This fresco shows several figures based on Rosso’s gods and goddesses, including Jupiter, Juno, Mercury, and Proserpina; there may be others. COPIES, SCULPTURE: Cleveland, Cleveland Museum of Art. Thetis. Bronze statue. See under St. Petersburg below. Ferraro, Palazzo Schifanoia. Thetis. Bronze statuette. See under St. Petersburg below. Haarlem, Von Pannwitz a Hartekamp Collection. Fortune or Atalanta, after Rosso’s Thetis. See under London, British Museum, below, and Planiscig, 1932, 53. London, British Museum, no. 1941, 10-8, 1. Dancing Girl, after Rosso’s Thetis. Bronze statuette. See under St. Petersburg below. This may be the statuette mentioned in Planiscig, 1932, 50, Fig. 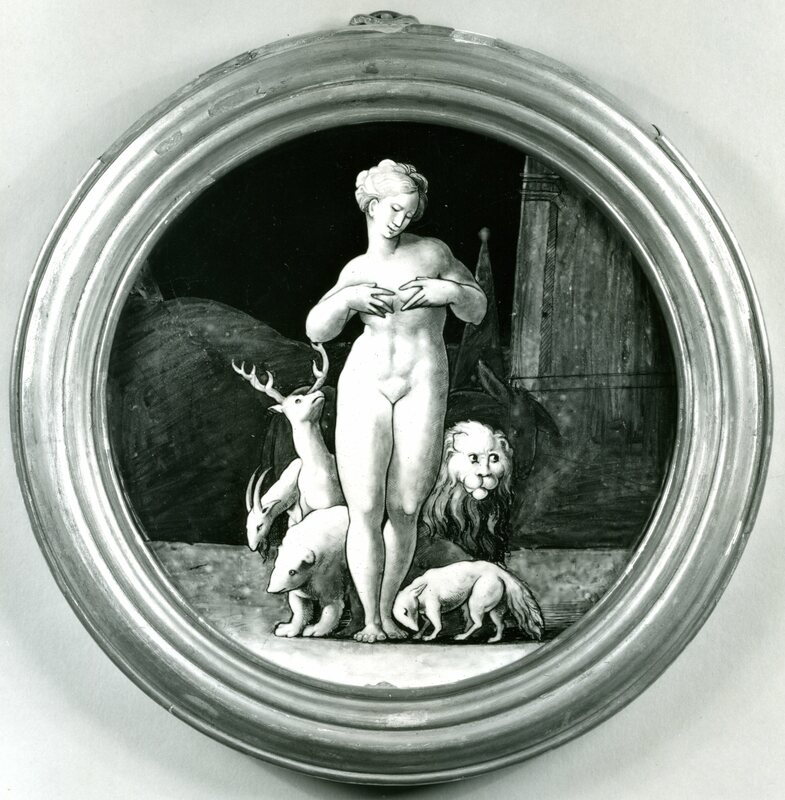 53, as Fortune or Atalanta and as in a private collection in Paris. Sold London, Christie’s, December 15, 1975. Thetis. Bronze statuette. See under St. Petersburg below. London, Victoria and Albert Museum. Pluto. Bronze statuette. W.V. Bode, Italian Bronze Statuettes of the Renaissance, London, 1907-1912, III, Pl. 230. Raggio, 1974, 75, 78, n. 1, as after Caraglio’s print, and by an artist of the School of Fontainebleau. Sold New York, W. Salomon Collection. American Art Association, April, 1923, no. 446, Fig. Pluto. Bronze statuette. Raggio, 1974, 75, 78, n. 1, as after Caraglio’s print, and by an artist of the School of Fontainebleau. Formerly New York, Stern Collection. Thetis. Bronze statuette. See under St. Petersburg below. Paris, Musée de Cluny. Attributed to Maffeo Olivieri, Female Dancer. Bronze statuette. 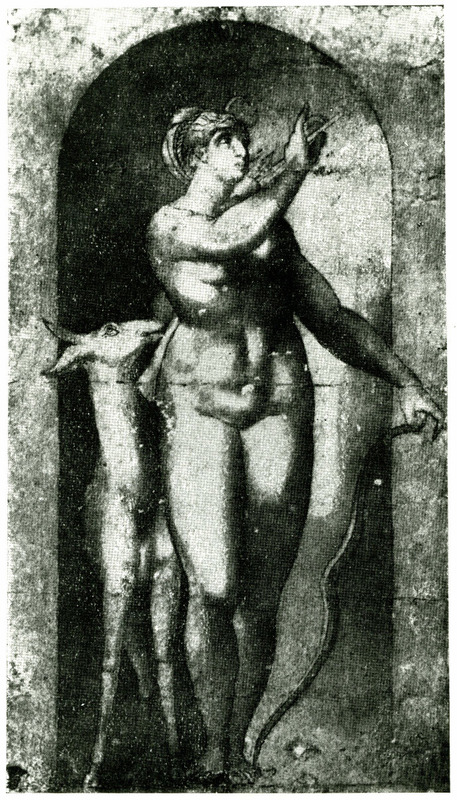 Androsov, 1976, 159, states that this figure is based upon Caraglio’s Minerva. Paris, Musée Jacquemart-André. Thetis. Bronze statuette. See under St. Petersburg below. Figs. 155, 156, as based on Caraglio’s Thetis. This relationship is also mentioned by Georges S. Salman, “An Attempt at an Analysis,” Connoisseur, 170, 1968, 20, and Figs. 3a, 3b, and by Androsov, 1976, 159. Androsov states that there are other examples of the statuette in the Clevelend Museum of Art, in the Palazzo Schifanoia in Ferrara, in the British Museum (1941, 10-8, 1), and another sold in London at Christie’s, December 15, 1975, one formerly in the Stern Collection in New York, and another in the Musée Jacquemart-André in Paris. Androsov, 1976, 161, and Figs. 6-8, indicates that a statuette of a Fawn in the Hermitage, attributed to Vittore Gambello, il Camelio, is based upon Caraglio’s Minerva, but the relationship here is not sufficiently close to make a dependency necessary. Venice, S. Marco. Matteo Olivieri, Two Candelabra. Bronze. Signed and dated 1527. W.D. Wixom, Renaissance Bronzes from Ohio Collections, Cleveland Museum of Art, 1975, under no. 80, believes that some of the figures on these candelabra are based on Caraglio’s Gods in Niches. Mentioned by Androsov, 1976, 159, 162, n. 11. From the illustration I have seen of part of one of these candelabra, a relationship to Rosso’s figures is not apparent (Wilhelm Bode, The Italian Bronze Statuettes of the Renaissance, edited and revised by James D. Draper, New York, 1980, 32, Fig. 32, as by Camillo Alberti). COPIES, ENAMELS: Baltimore, Walters Art Gallery, no. 44.218. Opis. Diameter 22.3. Inscribed: LL. LITERATURE: Verdier, 1967, 170-172, no. 104, with Fig., as by Léonard Limosin, about 1540. Thirion, 1971, 40, and Fig. 28, as by Limosin. Based upon Rosso’s Opis, and in the original direction, without the niche but in the background a rocky formation, a pyramid, and a building with a pilaster. Carroll, 1987, 126-127, no. 41, with Fig. (Fig.Baltimore, Opis). Sold Cologne. Paspart Collection, Schloss Hunegg, October 20, 1844, lot 542, Fig. Opis. Salt cellar. H. 19.1. Verdier, 1967, 170. Écouen, Château, Musée National de la Renaissance (formerly Château de Chaumont, and Paris, Musée de Cluny). Saturn, Jupiter, Apollo, and Mars. Enamel plaques in relief, oval, each 1.65 x 1.00. Inscribed: .SATVRNVS., .IVPITER., .SOL., MERCVRIVS., and each dated and signed: 1599/ PIERRE COURTEYS. LITERATURE: Kusenberg, 1931, 119, 209, n. 322. Thirion, 1971, 34, 36, Figs. 9-11, 37, Fig. 12. Bertrand Jestaz, in EdF, 1972, 448, no. 642 (Apollo), who says that they may imitate majolica reliefs by Girolamo della Robbia. Based upon Rosso’s figures in the original direction. However, the figures are all clothed. Part of a set of nine plaques, the others after prints by Boyvin and Marcantonio. (Formerly?) London, H.T. Hope Collection. Opis. Circular plaque, 27.3 diameter. Inscribed: LL. Formerly Visconti Collection, Sale, Paris, March 13-16, 1854, lot 44, then to Hope. Exhibited at the Victoria and Albert Museum, 1862, no. 1713. Verdier, 1967, 170. London, Victoria and Albert Museum, no. 2548-1856. Jupiter. 20.2 x 15. Grisaille with gold around billowing cape (Fig.London, VA, Jupiter). Paris, Louvre. Vulcan, Venus, and Juno. The Vulcan, concave, 24 x 16; the other two, arched at the top, 22 x 12, and inscribed VENUS (the S backwards) and IVNON. Laborde, Emaux, 1852, 164, nos. 188 and 189, the Venus given as Ariadne. Verdier, 1967, 110, under no. 55, with other bibliography. Thirion, 1971, 33, ns. 20-21, 34, Figs. 3-5, attributed to Pierre Pénicaud, active at Limoges in the second third of the sixteenth century. Based on Rosso’s figures in the original direction, the Venus derived from the Ariadne; a cape added to the Vulcan. Paris, Louvre. Diana. Signed and dated: LL 1573, and inscribed as in the print. Landscape added. Sold Paris, Spitzer Collection, 1893, cat. no. 481, Pl. XV; sold Vitta Collection, Hôtel Drouot, June 27-28, 1924, cat. no. 14, Fig. Diana. Oval plaque, 28.5 x 21. Inscribed: LL 1573, and VIRGO DIANA IST. Thirion, 1971, 34. Sold Paris, E. Gavet Collection, May 31, 1897, lot 716, formerly in Fould Collection; sold Heugel Collection, May, 1948. Opis. Oval plaque, 29 x 21. Inscribed on a banderole: OPAS SATVRN CONIVNX MATERQUE DEORUM. Verdier, 1967, 170. COPIES, CARVED FURNITURE PANELS: Amsterdam, Rijksmuseum. Secretary with relief panel of Opis. Thirion, 1971, 39-40, 40, Fig. 26, as sixteenth century. 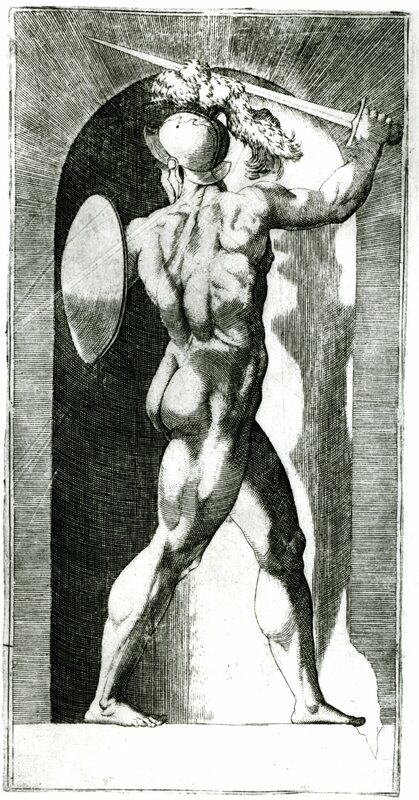 The figure of Opis is based on Rosso’s, in the original direction, with the body more muscular and the hair elaborated. Nantes, Musée Dobrée. Cupboard with relief of Thetis. Thirion, 1971, 38-39, Fig. 25. Raggio, 1974, 74. Figure based on Rosso’s, in the original direction. Paris, Louvre. Cupboard with relief of Hercules. Thirion, 1971, 37, 39, Fig. 23, as attributed to Hughes Sambin and datable around 1572. Thirion points out that the club held by the figure is a restoration and that the figure is based upon Rosso’s Vulcan, in the original direction. (Formerly?) Paris, sold around 1907, present whereabouts unknown. Cupboard of two parts with reliefs of Neptune, Pluto, Saturn, Vulcan, and Mercury. Thirion, 1971, 34-35, 38, Fig. 38, as of doubtful authenticity, but the reliefs may be original. Known only from a photograph in the Bibliothèque Forney. 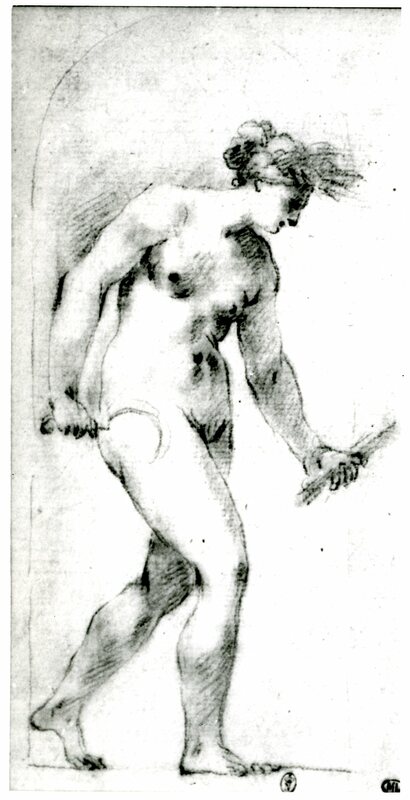 Based on Rosso’s figures, in the original direction, but Thirion states that because of the use of countertracing by the woodcarvers, they could have used the reversed copies of the prints, one set of which is by Du Cerceau (E.54, 1 – 20), others, anonymous (E.117, 1 – 20 and E.118, 1 – 17). Paris, Musée de Cluny. Neptune. Wood relief. Thirion, 1971, 40, as a mediocre panel after Rosso’s figure, reproduced in Monographie du musée de Cluny, Paris, Armand Guérinet, n.d., Pl. 72. St. Petersburg, Hermitage. Small chest with reliefs of Ceres, Diana, Thetis, Pluto, and Ariadne. Birukova, in Actes, 1975, 49-55, 50-51, Fig. 5-8, as French, mid-sixteenth century, art of Fontainebleau. The five figures are based on Rosso’s in the original direction. 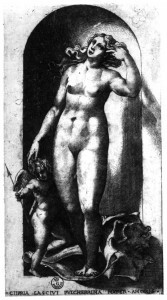 A sixth, Venus, is derived from the reversed copy of Marcantonio’s print, after Raphael (Bartsch, XIV, 234, 311). COPIES, OTHER OBJECTS: Écouen, Château, Musée National de la Renaissance (formerly Paris, Musée de Cluny), no. 5951. (Cluny 22140). Lock plate. Iron. This lock plate shows a façade with three niches, each with a figure in high relief. The center figure is Vulcan, after Rosso. 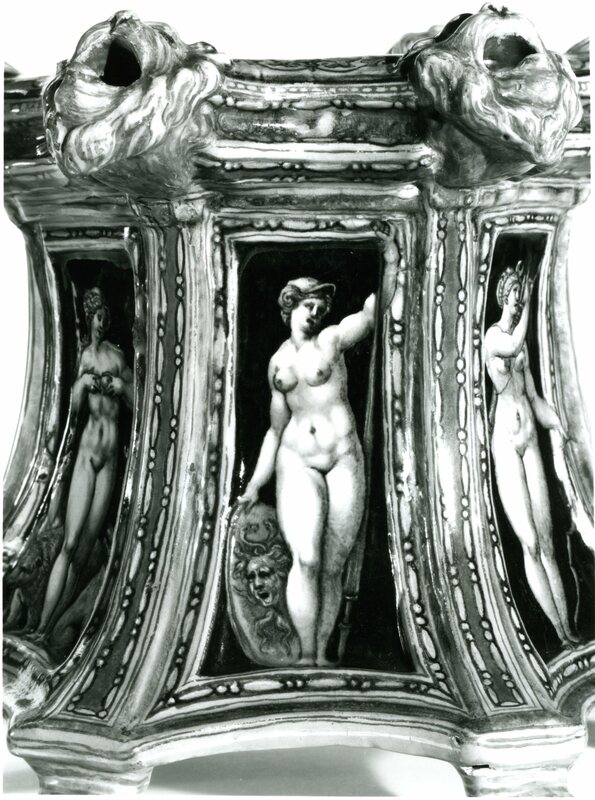 The side niches have female nudes with one arm raised similar to Rosso’s Minerva. LITERATURE: Carroll, 1987, 126, n. 28, under nos. 21-40. London, Soane Museum. Stained glass medallion with Jupiter derived from Rosso’s figure. The medallion is one of four, the others of which are not related to Rosso. LITERATURE: Carroll, 1987, 126, n. 28, under nos. 21-40. London, Victoria and Albert Museum, no. W.153-1910. Bellows with relief of Opis. 75.6 x 88.4. LITERATURE: Verdier, 1967, 172, n. 2. Thirion, 1971, 40, notes that he has certain reservations about this object. Bertrand Jestaz, in EdF, 1972, 427, no. 592, as related to French furniture of the second half of the sixteenth century. Miles, 1973, 32. Carroll, 1987, 126, n. 28, under nos. 21-40. COPIES, MAJOLICA: Berlin, Kunstgewerbemuseum, Inv. no. K. 1903. Orazio Fontana?, Dish cover with Apollo and Daphne. 19.6 diameter. Hausman, 1972, 285-287, no. 207, Fig. The figure of Daphne is based on Rosso’s Hebe, reversed. Braunschweig, Herzog Anton Ulrich Museum, Inv. no. 16. Venetian(? ), around 1550. Plate with Venus in a Landscape. Lessmann, 1979, 393, no. 569, Fig. The figure is based on Rosso’s goddess. Inv. no. 527. 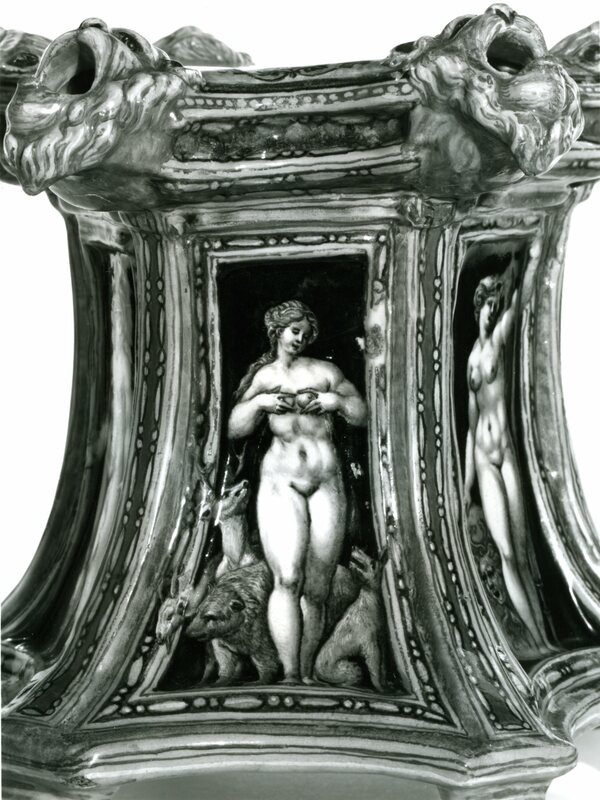 Workshop of Fontana, Dish with Vulcan at his forge and Venus standing at the side. 17.2 diameter. Lessmann, 1979, 203, no. 193, Fig. 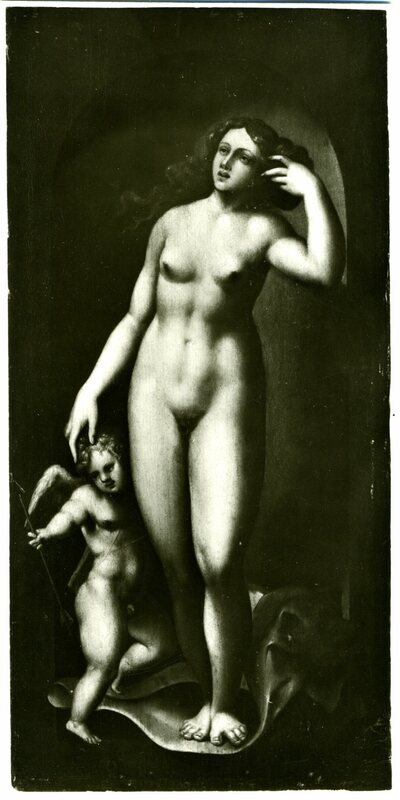 The figure of Venus is based on Rosso’s Juno. Inv. no. 1145. Venetian, 1550-1560. 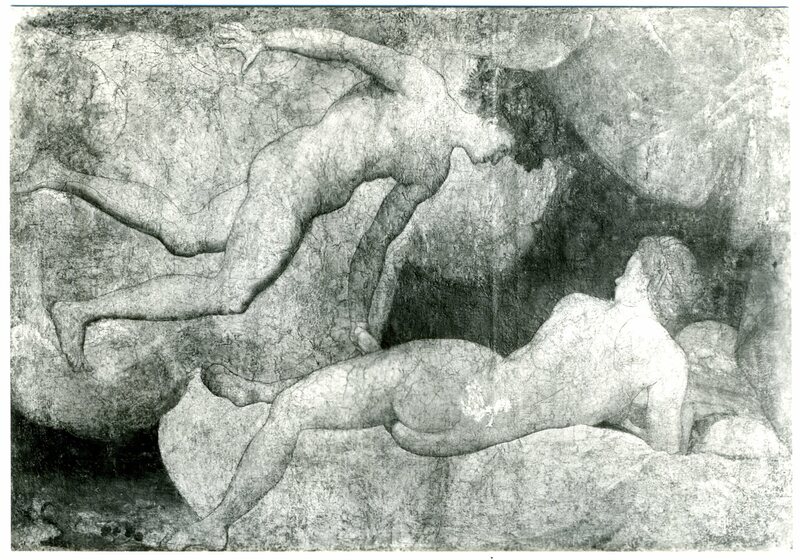 Plate with Ariadne in a landscape. Lessmann, 1979, 404, no. 595, Fig. 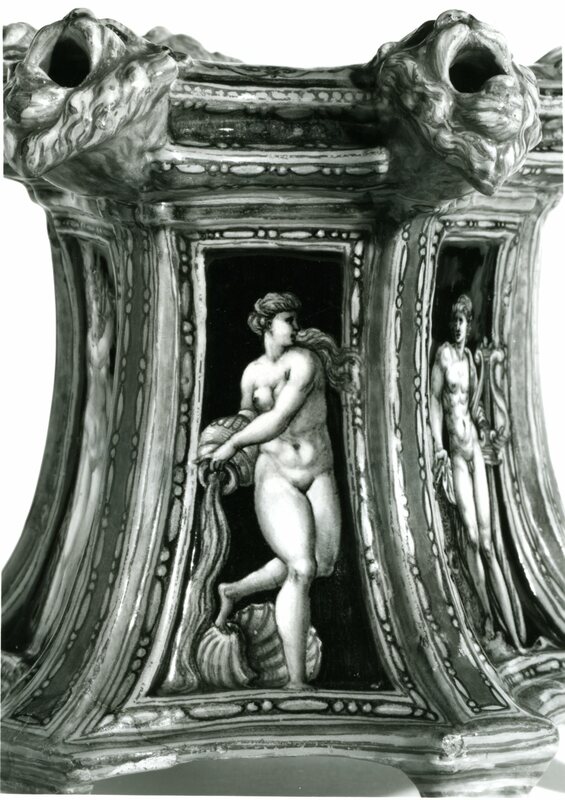 The goddess is based on Rosso’s figure with the addition of drapery crossing her left thigh. London, Wallace Collection, III D 140, Urbino, mid-sixteenth century. Plate with Saturn in a landscape. 8.66 diameter. Norman, 1976, 259-260, C130, Fig. The figure is based on Rosso’s Saturn.